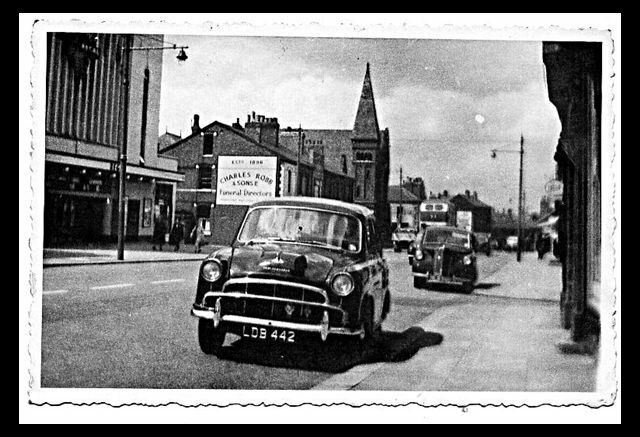 LINKS Stockport Road, The Shops & Road Transport in the 50s and 60s. 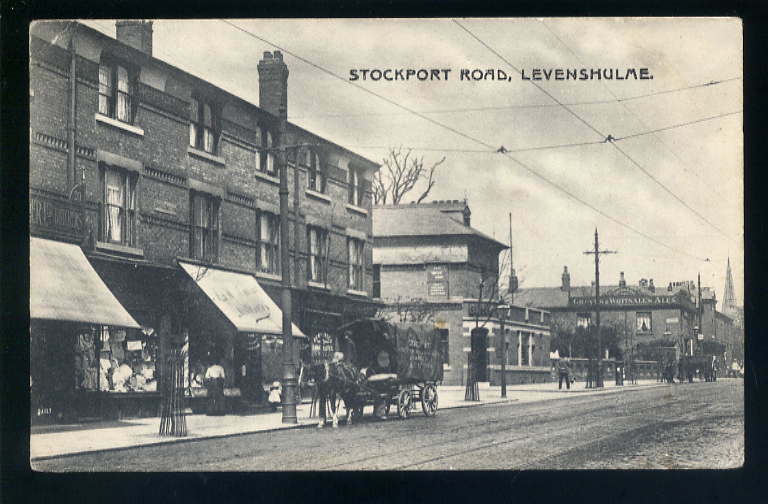 I have always been intrigued by this Levenshulme Street! Apparently there was a Crescent Estate at one time. The Crescent consisted of The Crescent and Crescent Grove. 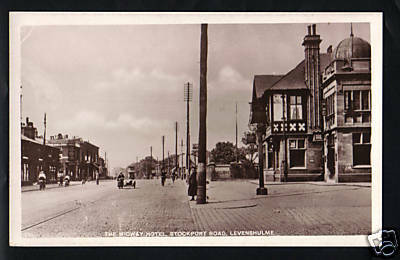 Another postcard view showing the west side of Stockport Road with the Church Inn in the background. This photo shows the almost reverse view from the previous one. Taken from in front of the Lancashire & Yorkshire Bank Building? 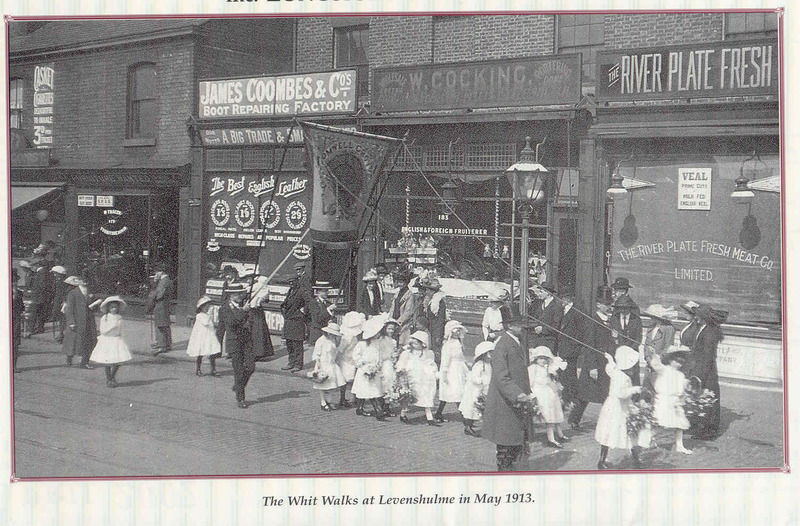 It shows people waiting for a parade, possibly the Whit Walks. 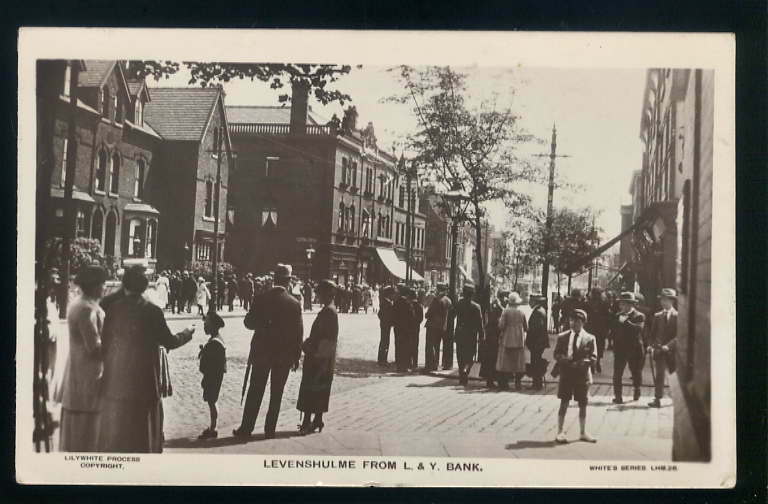 You can gain some idea of the middle class nature of Levenshulme in the 1920s from the smart dress of the people. Sailor suits, straw boaters, smart suits and dresses. A far cry from today's "Scruffy" attire!! 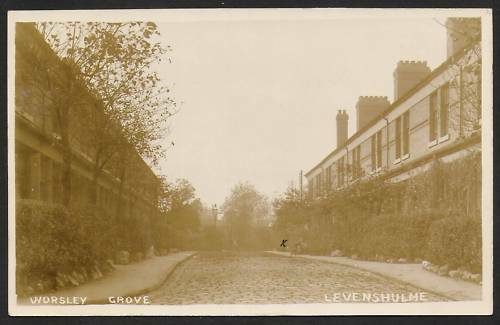 A postcard view of Worsley Grove looking east to the LMS railway from Stockport Road.,early 20th Century. 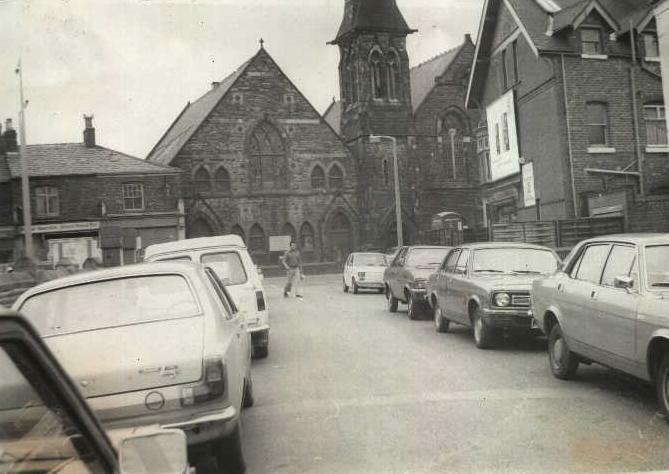 There were still cobblestones on Worsley Grove in the 1980s. Are they still there? 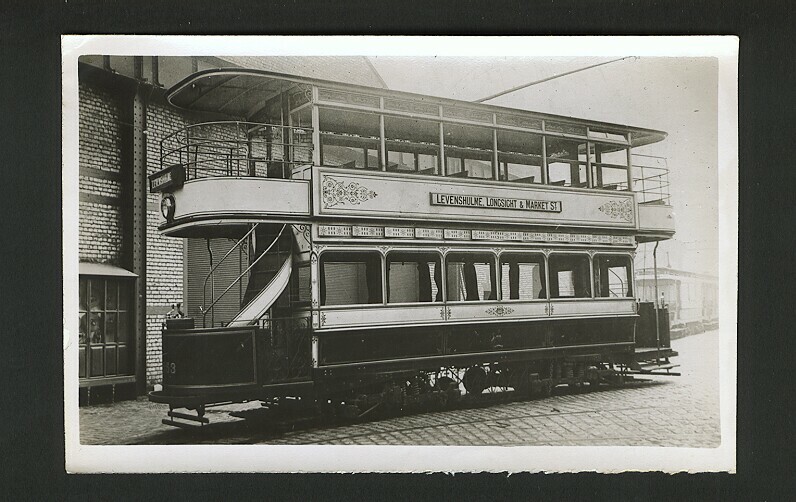 A postcard view of a tram car in roughly the same location as the previous photo. Period would be pre-World War One. This rather grainy Whit Walks photo relates to the preceding photo. The shops on the left background are the same ones to these! Note Coombes Boot Repairing Factory and The River Plate Fresh Meat Co! How fresh was that meat after travelling all the way from Argentina?? 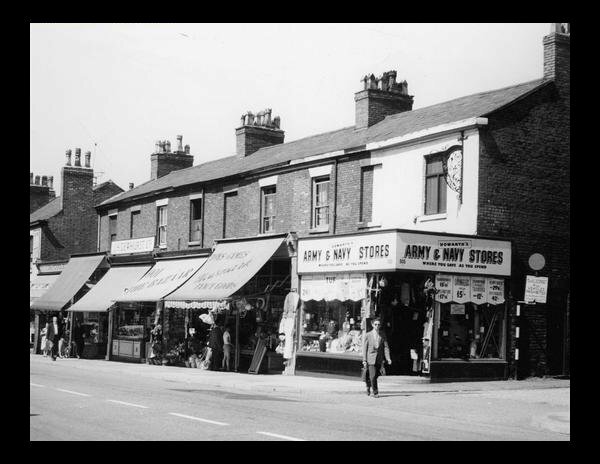 Some of the shops between South Street & Farmside Place 1960s. 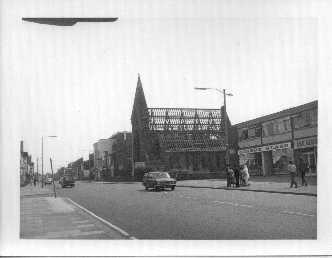 The corner of Chapel Street & Stockport Road. Many changes her in recent times! 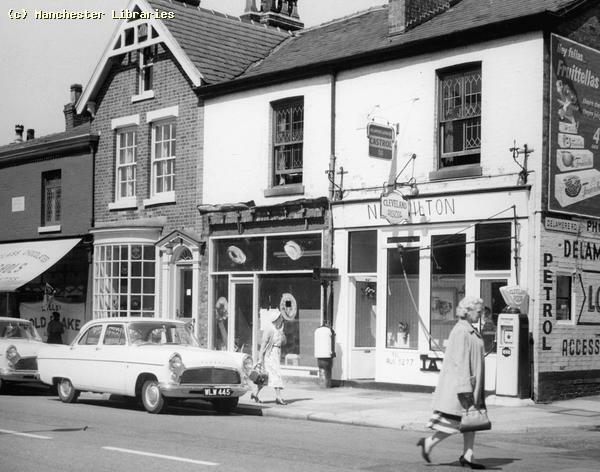 The shops opposite to the Railway Inn, butchers, chemists, Halsall's Newsagents, Trustee Savings Bank etc. Stockport Road, South Levenshulme on a gloomy day in 1994. This is the old Manchester & Salford Co-op store, which appears to be a burned out shell! 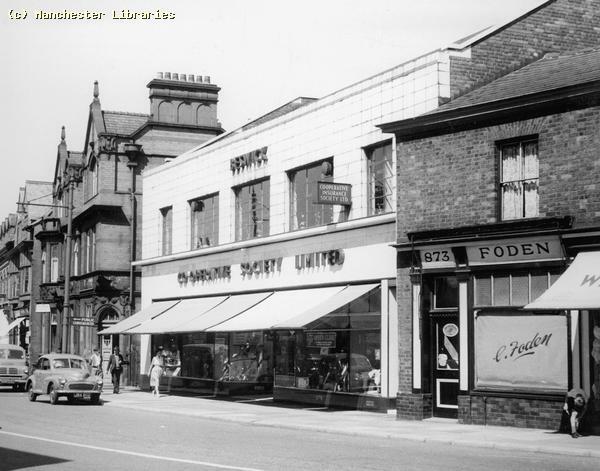 This building, built in the 1920's, boasted a large grocery & provisions department & a separate butchers shop in the 1950's. 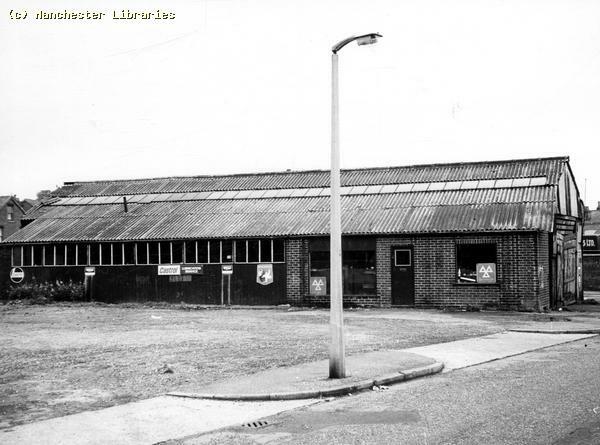 It converted to a Supermarket in the early 1960s. The large hall upstairs was for many years the location of the "infamous" Browns School of Dancing! I lived nearby but never went to Browns. I would like to hear from anyone with memories of Browns. Did they have live groups? Did anyone famous ever play there? 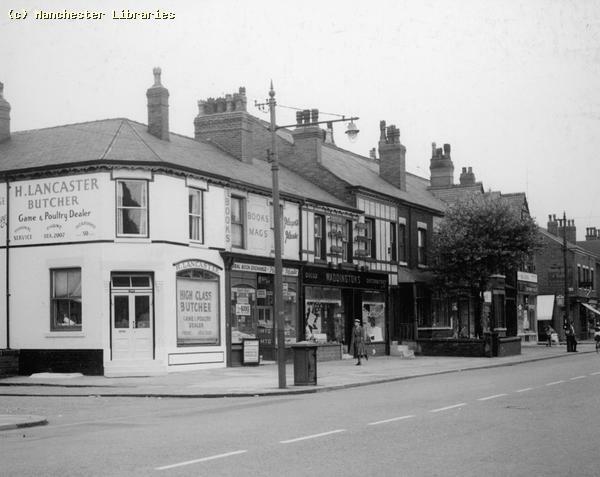 Shops on Stockport Road, opposite Crayfield Road & Levenshulme Town Hall. 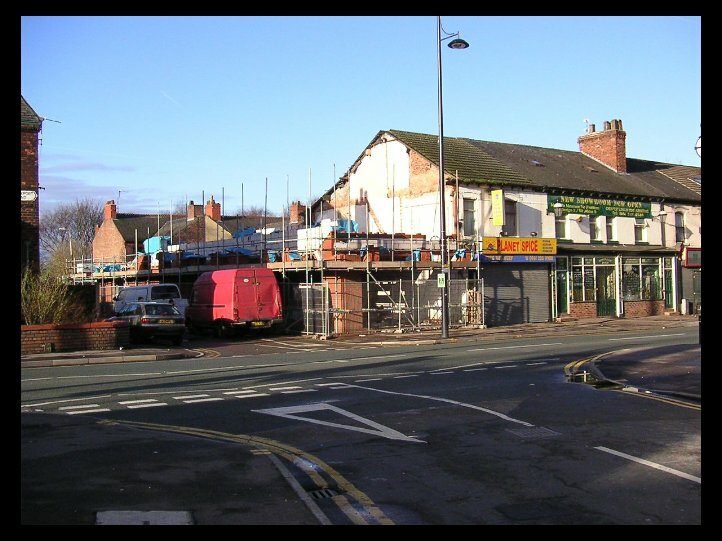 The corner shop, which was a newsagents for all the time that I lived in Levenshulme is in the course of re-construction. I believe that there was a fire here some time ago. Remember Summerhays Fruit & Flower Shop & Pendleton's Toy Shop. 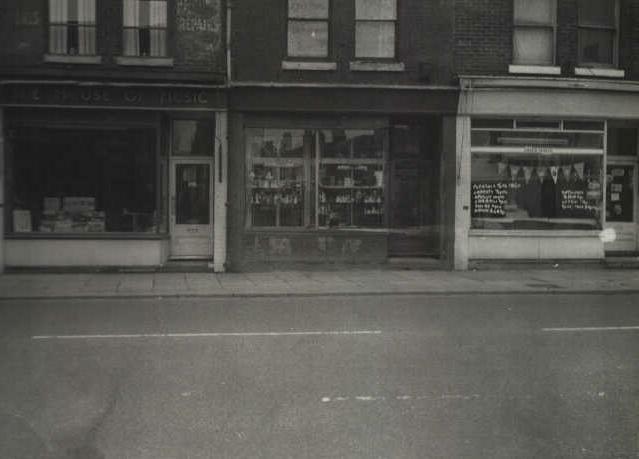 They were both on this block, along with Casemores Electricians and a host of other small shops. The road at the side was unadopted. Did it have a name? The two large houses before the bridge were, I think, owned by the railway. They were probably for the use of the original stationmaster of Levenshulme South. ( Photo. Andrew Barber) Update:- The unadopted road was called Kevin Street. 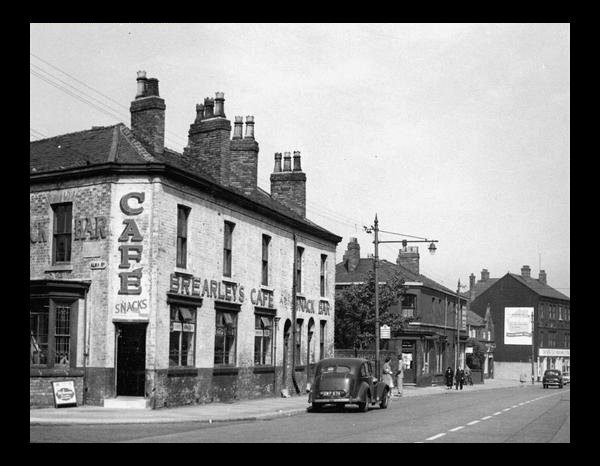 A familiar view of the corner of Stockport Road & Albert Road taken in the early 1950s. 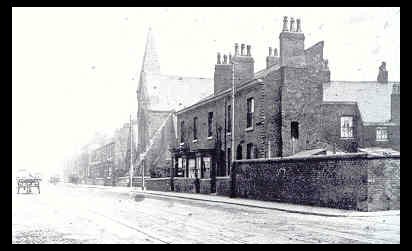 Clues to the date are mainly the absence of tram lines & overhead wires. 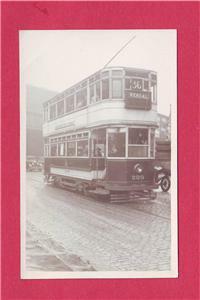 Trams ceased to operate in Manchester in 1949. 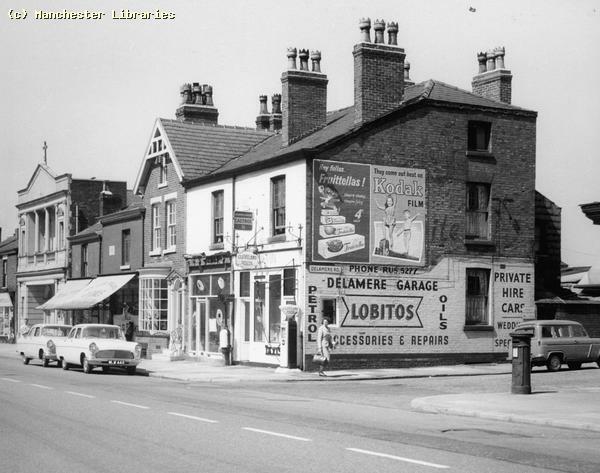 Note the signpost on the corner, and the Belisha beacons & bollards. A similar view, perhaps at the turn of the 20th century. 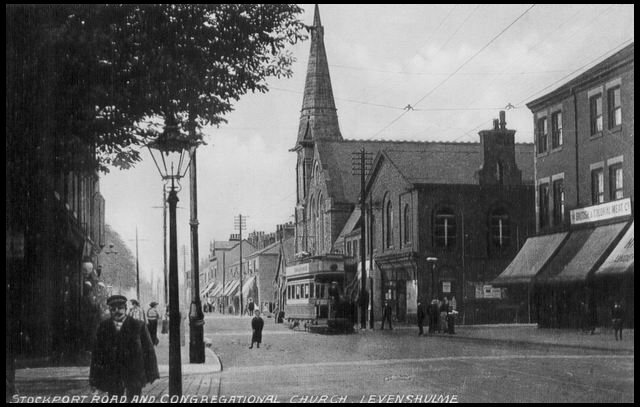 Levenshulme as we know it was already built at this time. Are the men waiting for the pubs to open? It could be a Sunday as they all look very well turned out. People certainly kept dress standards in those days! 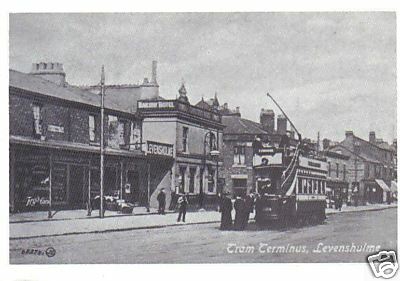 Tramcar on Stockport Road with New Day Furnishing store in the background. This view is postwar, but prior to 1949.Note shops in the background & white telephone box! 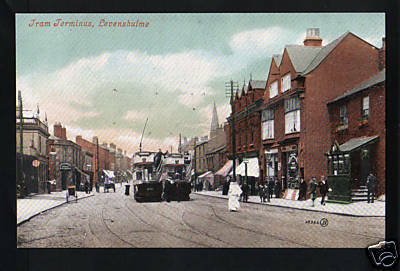 The Tram terminus earlier in the 20th century. 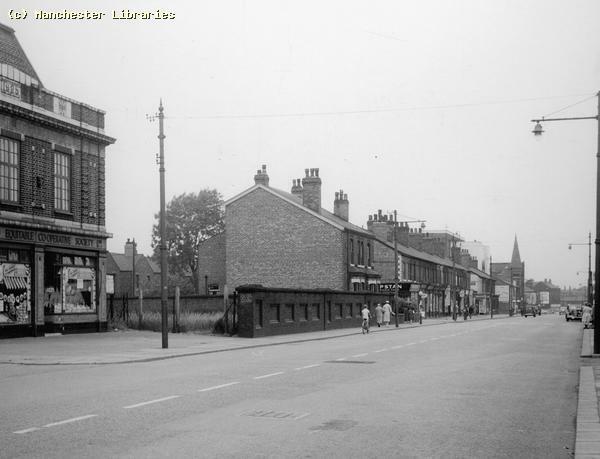 Stockport Road at the corner of Lloyd Road, early 1950s. 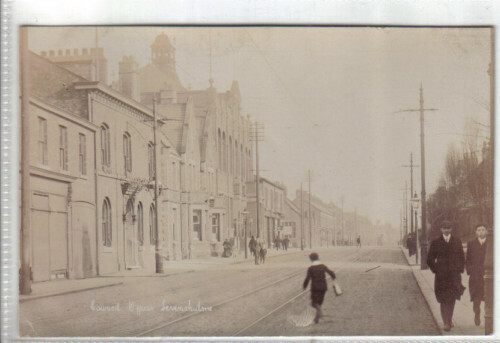 Note bus station verandah & cobbles on Lloyd Road. The tram tracks were still there in the 1950s & early 60s! 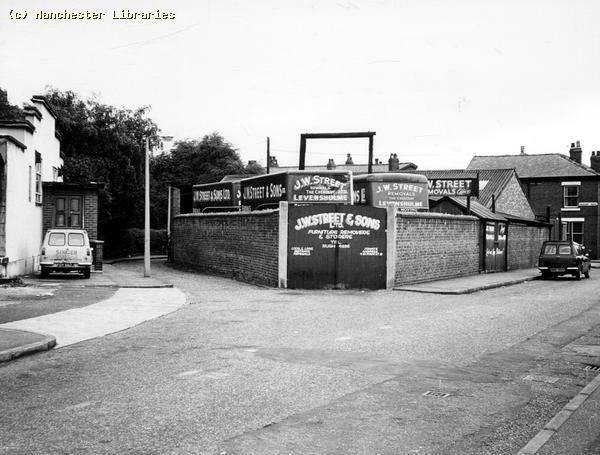 Isherwoods Garage is in the background with the spare land beyond at the corner of Cringle Road. A Shell filling station was built on this land in the early 1960s. 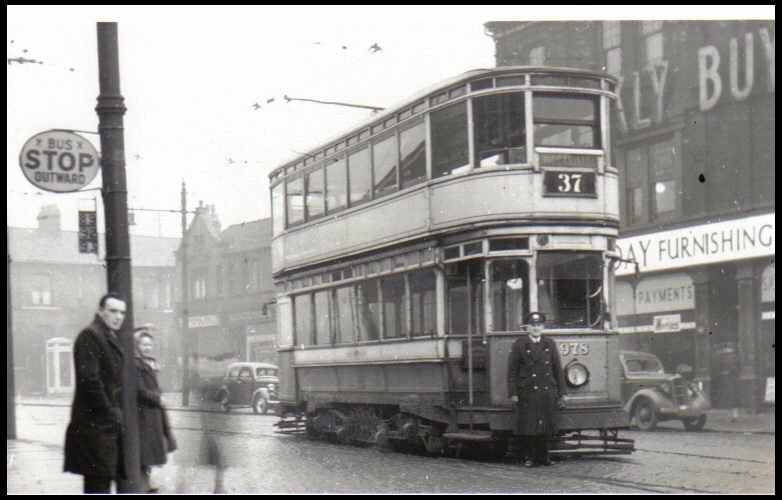 Manchester tram at the Lloyd Road terminus in the late 1940s. 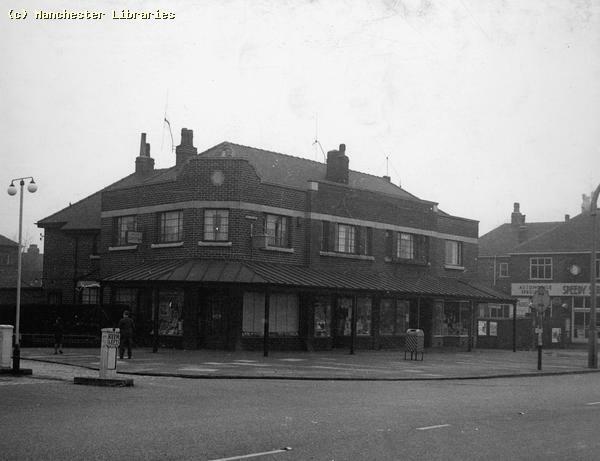 Note the ornate tram shelters, sadly demolished in the 1960s. Also the single decker bus in the background. This was probably a North Western Leyland Tiger on the 22 service to Eccles. 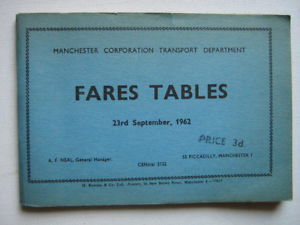 This service was likely a joint service with Manchester in those days. 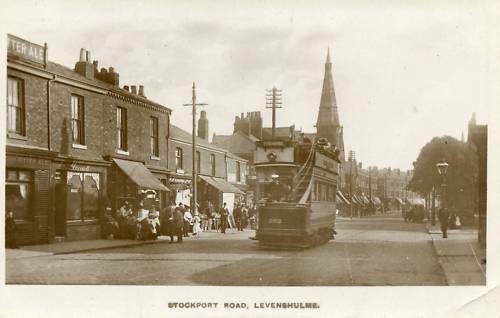 A Stockport tramcar heading down Wellington Road with Llyod Road terminus in the background. 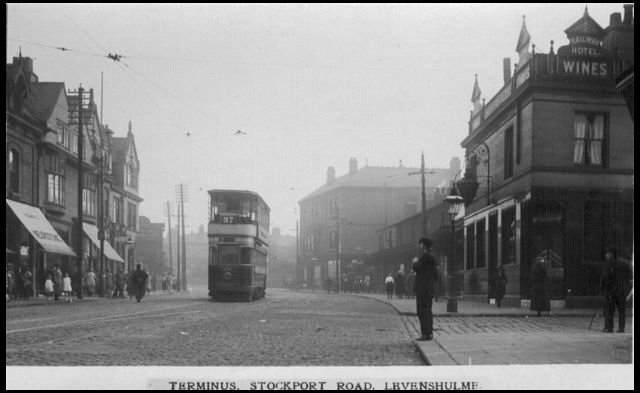 Stockport kept its tramcars until 1951! 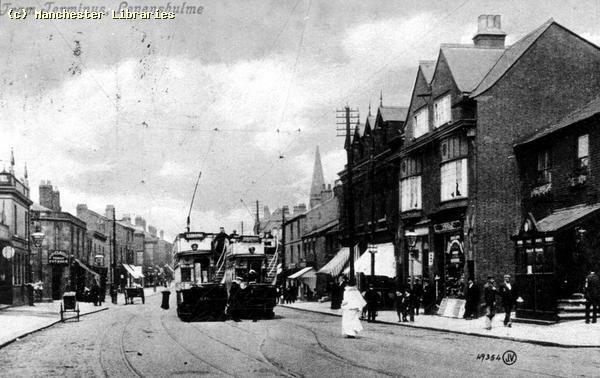 Note tram terminus & corner of the Monarch Laundry in the background. 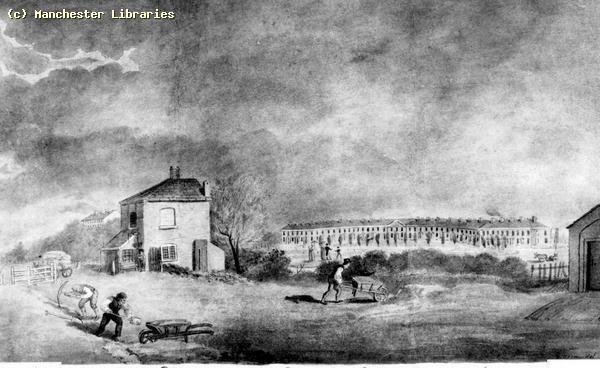 The building behind the wall is probably part of Blackbrook Farm. I don't really remember this wall! 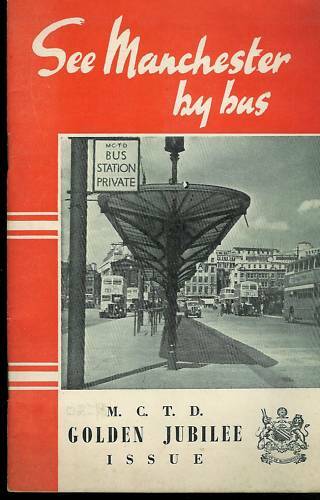 Was it demolished to make a laybuy for buses sometime in the 1950s? The Manchester-Stockport boundary lies just in the background. 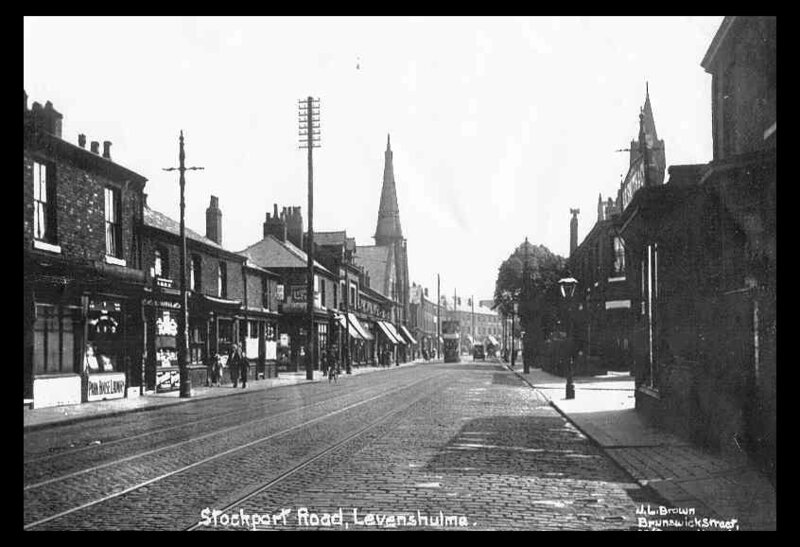 In the early 20th century this part of Stockport, namely Heaton Chapel, would have been in the county of Lancashire! 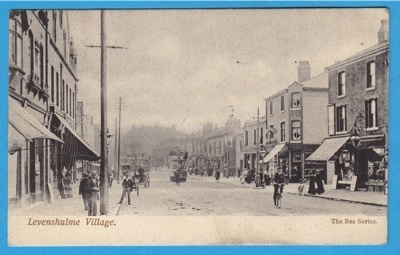 A rather faded postcard view of the previous location in the early 20th century. Tram lines, but no cars. Happy days!! 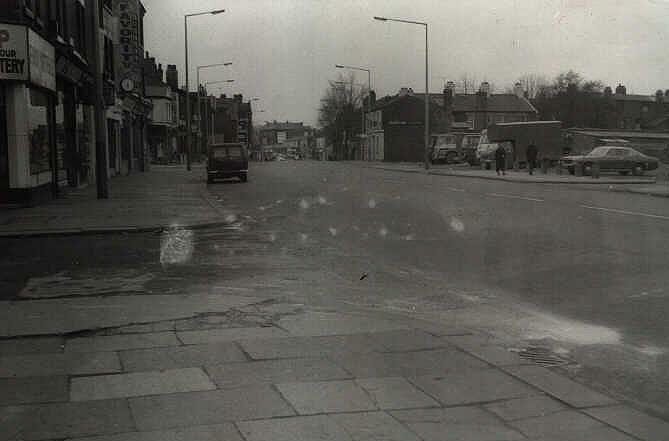 Two views looking North on Stockport Road The first is early 1970s, looking much as it did in my childhood. The second December 2007. Some changes evident. Notice how most of the chimneys have disappeared! 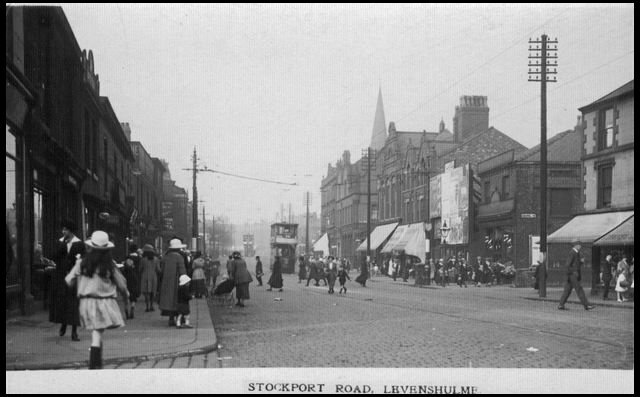 Stockport Road at the corner with Alma Road. Compare to the next photograph taken in 1959. 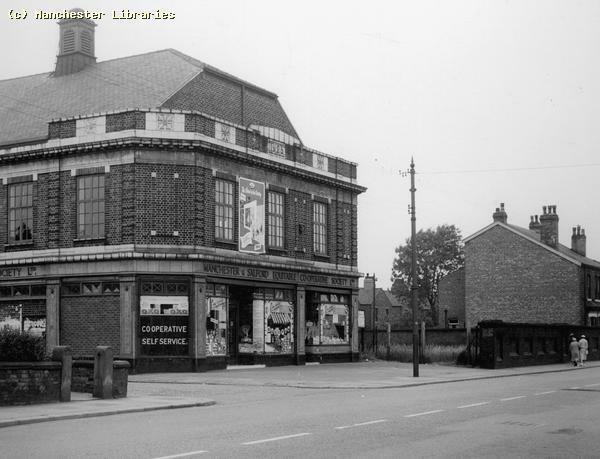 The opposite corner of Alma Road at an earlier date. Note cobbles tram lines and planning annotations ! Believe it or not the cobbles and tram lines are still under the current road surface. They were just paved over when the trams ceased running in 1949!! 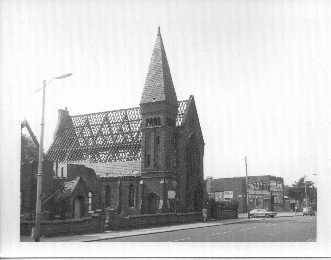 The two previous photos show the demolition of Alma Park Methodist Church. What was the date? 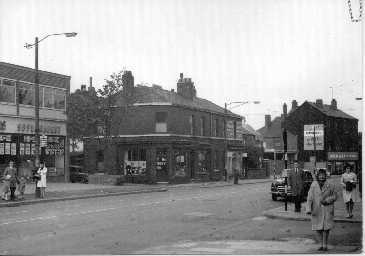 The top photo facing south includes George Glass & Regal Cleaners on the corner of Alma Road where Brearley's Milk Bar once stood. These stores are now "pound stores" and the site of the church is a supermarket, Quiksave?, in 2012. A typical newspaper advertisement, from MEN March 17th 1961. Ready Radio Levenshulme Branch, 893 Stockport Road. A 17inch Black & White TV to rent for only 52 1/2p a week. Does anyone still rent in 2008?? 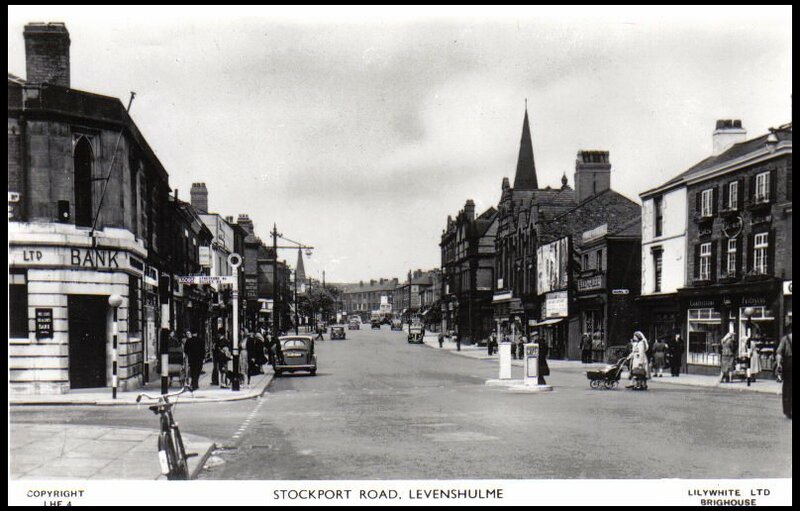 When I was born in 1949 most households in Levenshulme would have used coal or coke for heating their homes. Open fires were the order of the day, there was no such thing as central heating, and houses were exceptionally cold in the winter. The smoke from the coal fires would carry soot up the chimneys, and so it was necessary from time to time to have your chimney swept to get rid of the accumulated soot. 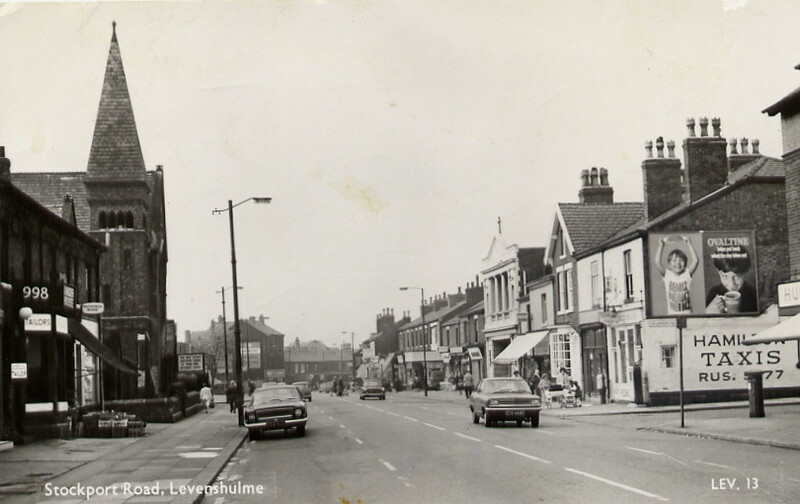 Levenshulme had several sweeps in my time, and I remember Mr. Heathcote being the one we used most. 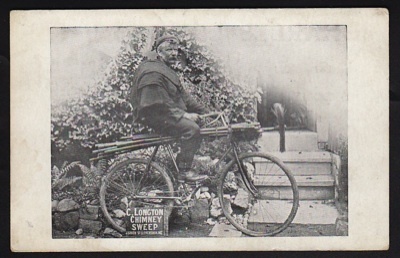 Chimney sweeps were also considered lucky, and many a wedding was blessed by the presence of a sweep. 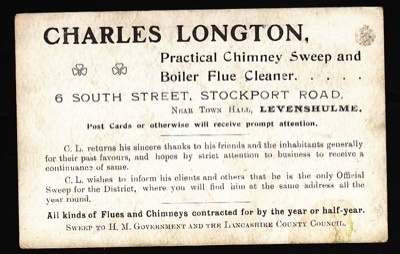 The two images above show a photo of Charles Longton, and his business card. This shows him to have lived at 6 South Street near the Town Hall. It also shows that he was contracted to H.M. Government and Lancashire County Council. 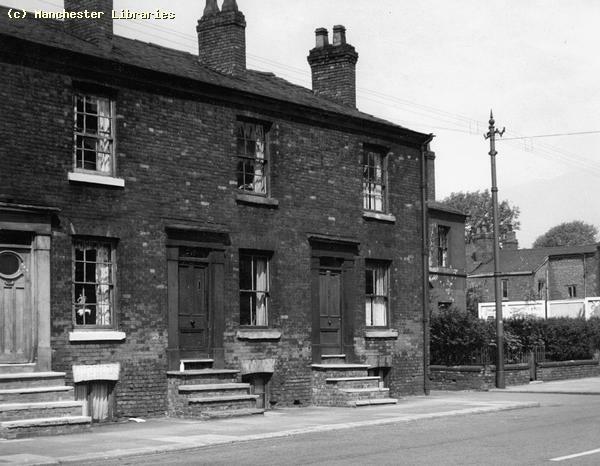 South Street was a narrow entry like street next to the Levenshulme Pub, with a row of very old houses. Stockport Road "On The Buses"
From Matthews Lane in the North to Lloyd Road in the South, Stockport Road was part of the busy A6. In the 1950's & 1960's the sight of the buses operated by the local corporations & bus companies was part of the daily scene. 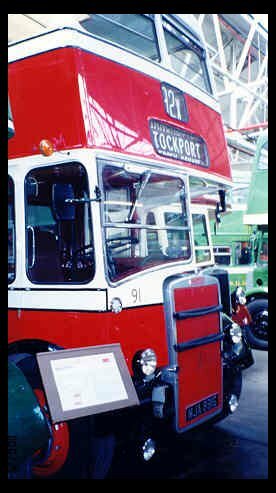 Buses were operated on Joint services by Manchester Corporation Transport & Stockport Corporation i.e. 92 & 89 services. Also the 93 & 94 operated from Lloyd Road. 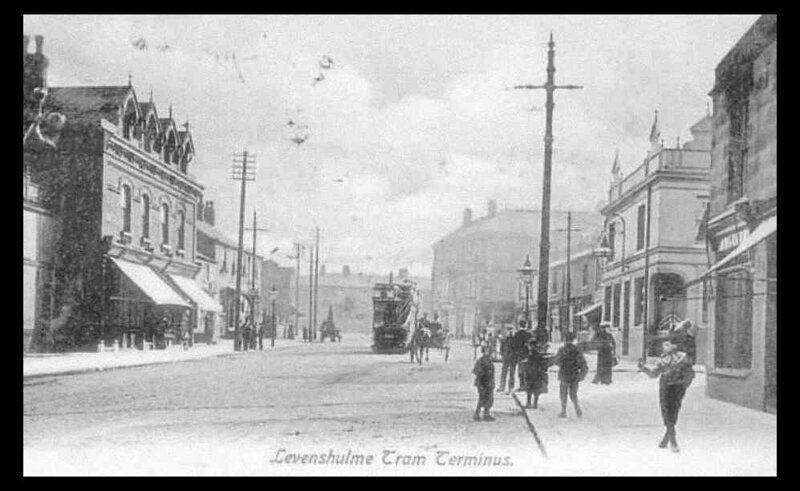 Other services that operated through Levenshulme included the 19 & 19X and the 22 service to Eccles. 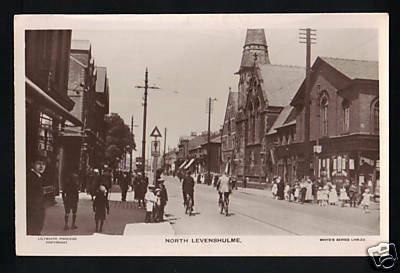 Other operators that ran through Levenshulme included The North Western Road Car Company, Manchester/Buxton service No.28. 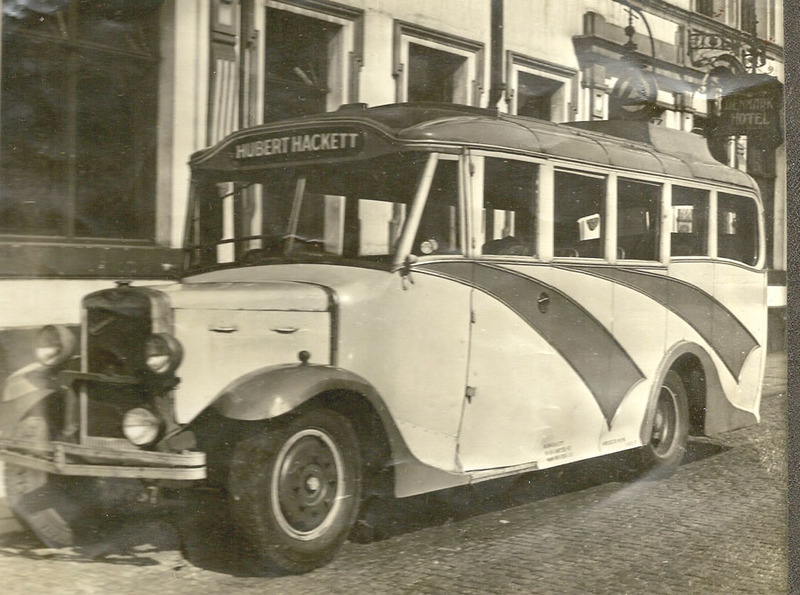 It was also common to see local tour operators coaches, Hartley's, Holts, Hackett's etc. 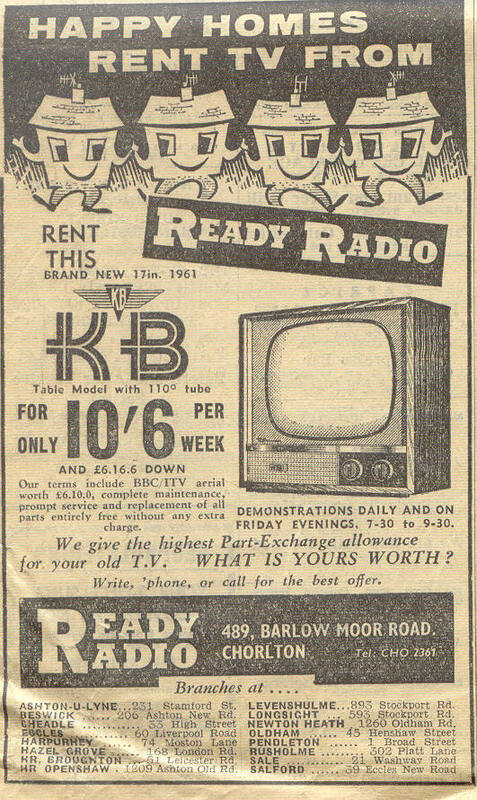 And also long distance operators such as Yelloways, Barton, Ribble, Midland Red Etc. 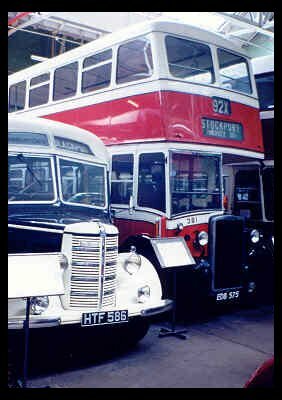 Manchester Corporation, Stockport Corporation & North Western buses now preserved in the museum at Boyle Street, Cheetham Hill. The Manchester 92X may be a Crossley. Note the destination blinds! The museum is well worth a visit. More Manchester buses at Boyle Street. Typical of the types & colours operated in the 50's & 60's. 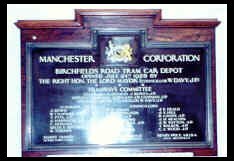 The second picture is of the commemorative plaque from Birchfields Bus Depot. Birchfields was originally a Tram Car Depot opened in 1928. Now no more, this is all that remains! 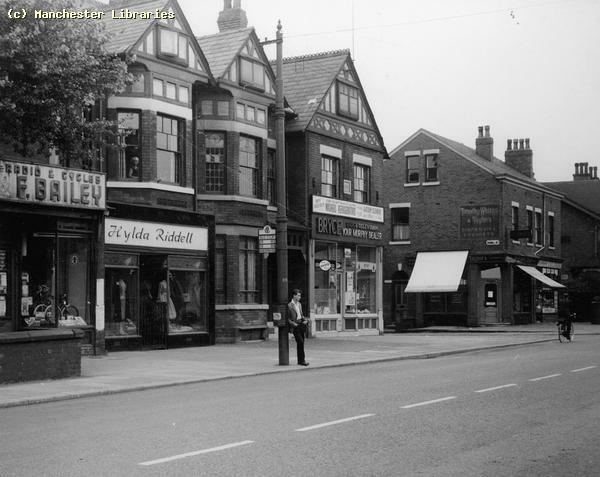 Birchfields was on the border of Levenshulme & Rusholme. 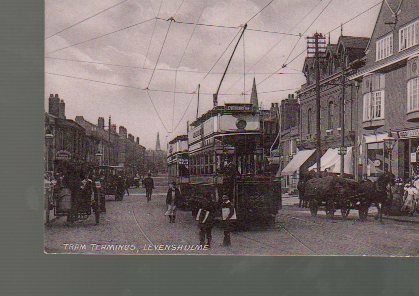 Levenshulme tramcar 1920s. 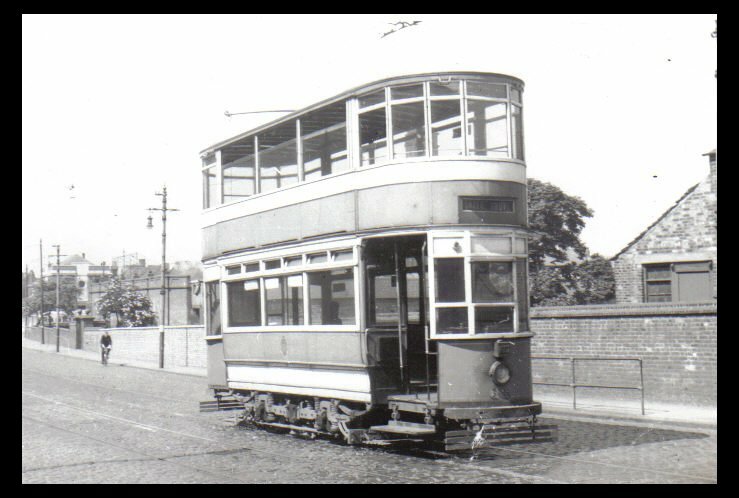 Probably taken at Hyde Road Tram Depot. 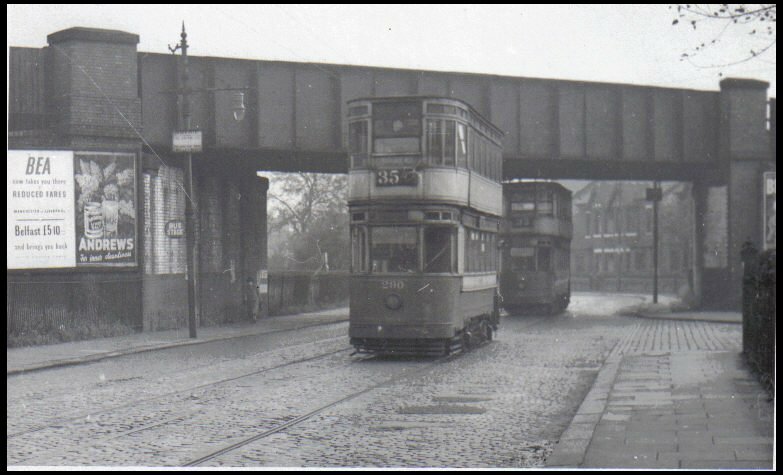 This tramcar appears to be heading south on Slade Lane heading north on a service from East Didsbury to Kersall, Salford. 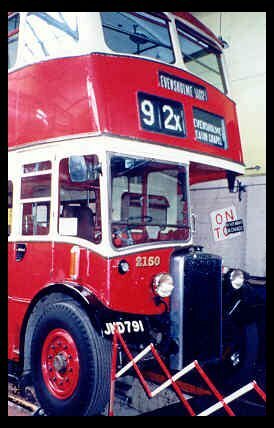 Yet another preserved Stockport 92X bus. Stockport operated a varied fleet, and this may be a locally built Crossley. The coach next to it is a Bedford OB, operated by Warburtons Coaches on a service to Blackpool. In the 50's day trips to Blackpool & Southport were typically operated by this type of vehicle. Quite a long and interesting journey before the advent of motorways. The buses passed through just about every town centre on the journey. They even made comfort stops at pubs in both directions! Bus Tickets and other Trivia. 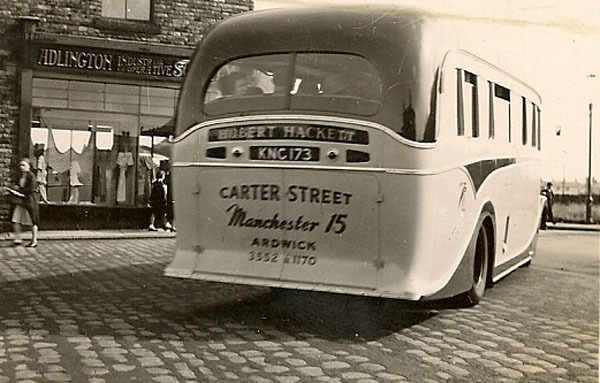 Manchester and Stockport Corporation Buses. It's amazing what people hang on to, but thank goodness they do. These are after all small pieces of history. And to think we just threw them away at the end of a journey! Shame!! 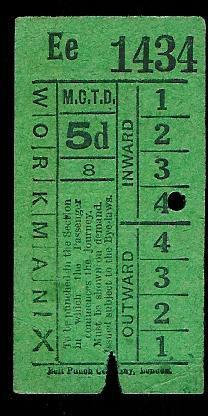 These ticket images were all found on Ebay, where they were being offered for sale! Essential reading for any latter day "Anorak" in the sixties! Another Ebay find. 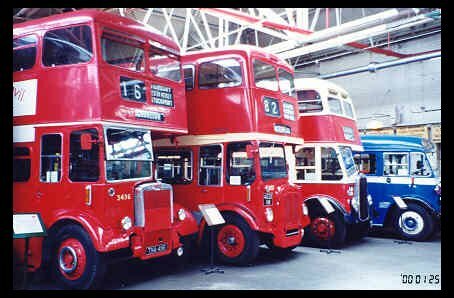 50 years of Manchester Corporation Transport. A nice souvenir and a nice view of Parker Street Bus Station in 1953. 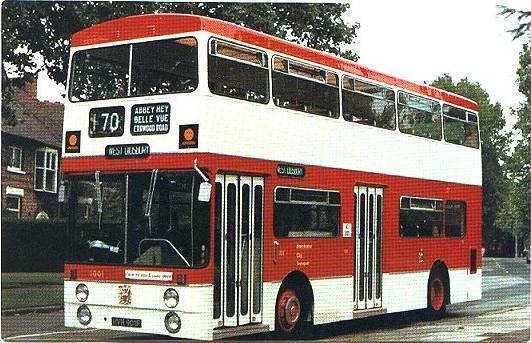 This is a preserved Manchester City Transport Atlantean sporting pre-Selnec colours. Note the route number 170. This was a one man operated service. The 170 & 169 service were originally known as the 19 &19X service. They ran from Abbey Hey in Gorton to West Didsbury/Southern Cemetery. 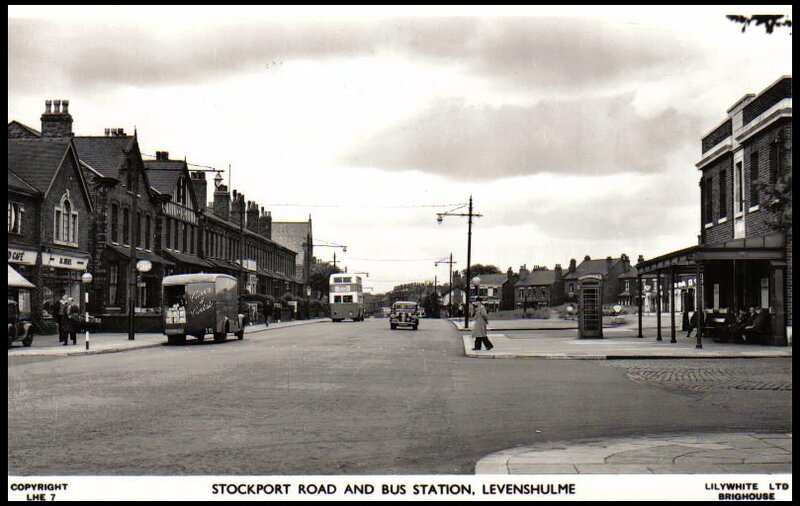 In Levenshulme the 170 ran along Mount Road, Barlow Road, Cromwell Grove, Stockport Road, Albert Road, Alma Road and Errwood Road. 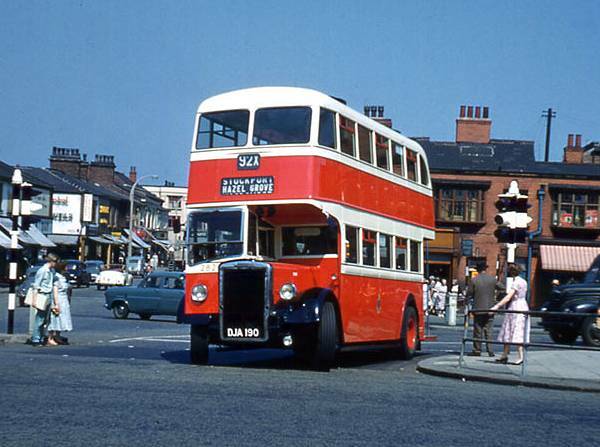 The 169 service followed a similar route except that it carried on along Albert Road to Slade Lane where it turned south along Slade Lane and Burnage Lane. It rejoined the 170 route at Green End. One has to wonder why Selnec chose the awful orange and cream colour scheme when they could have retained this very smart livery!! SELNEC (PTE)? This was the start of the end of local towns operating there own services, and what eventually lead to the "mayhem" of the privatization of local bus services The letters stood for South East Lancashire & North East Cheshire. ( Passenger Transport Executive). 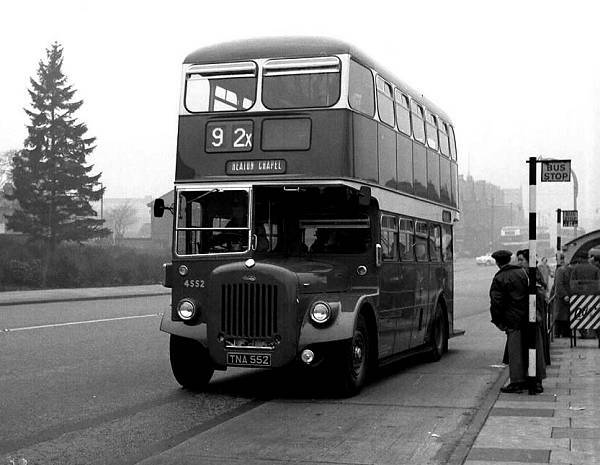 A nice photo of a Manchester Corporation 94 bus leaving Lloyd Road terminus on its long journey to Southern Cemetery. This service ran right through Manchester City centre. Does a similar service still operate in 2009? A shiny new looking Daimler on the 92X service to Heaton Chapel in 1957. 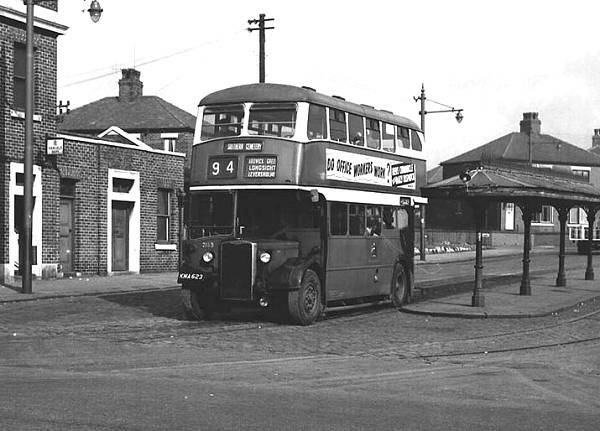 This photo was taken at the bus pull in just beyond Lloyd Road and just over the Stockport Boundary. I would think that the 92X would go only as far as Manchester Road, Heaton Chapel, then turn around at School Lane and head back to Manchester! 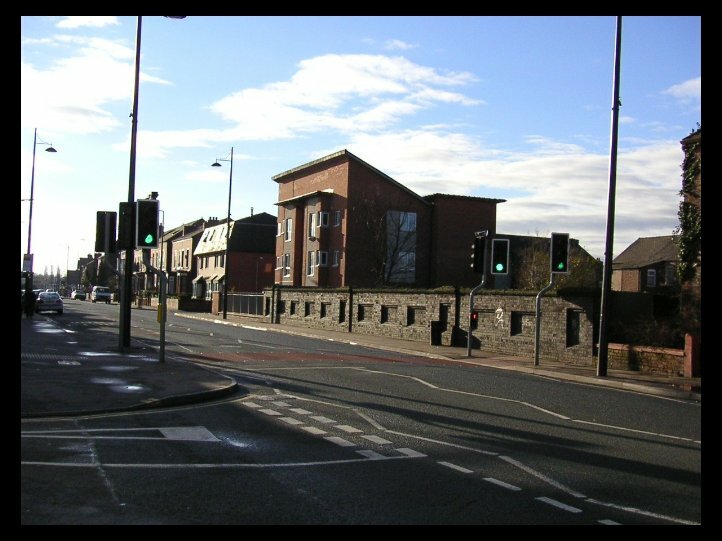 The transport office on the corner of Lloyd Road December 2007. Stockport Corporation Buses on Stockport Road. 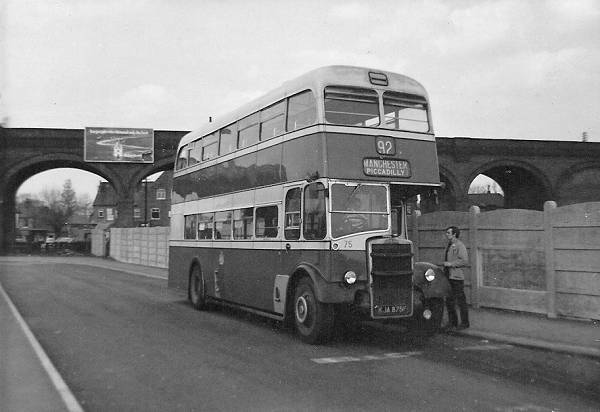 A Stockport Corporation Leyland Mancunian coming out of Heaton Lane Depot on a Service to Hazel Grove. No route number is shown but this could be a 92. 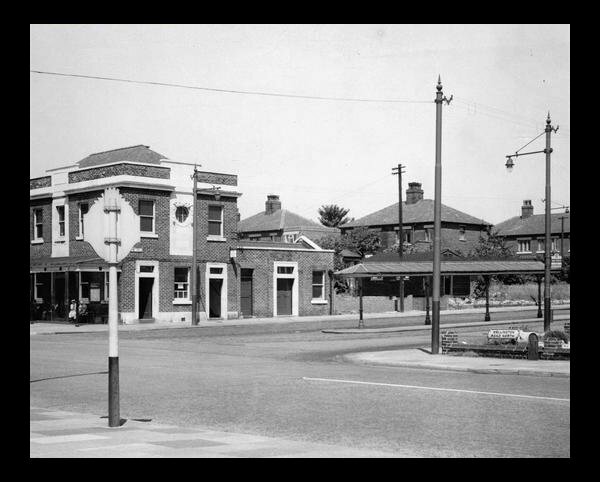 Note the old Heaton Lane Tram Depot, Stockport Viaduct and the George Hotel on the corner. Also the old style traffic lights, police call box and the safety barriers. Photo taken in the 1950s. This photo shows a Stockport Corporation Leyland Titan ready to return to Manchester Piccadilly. 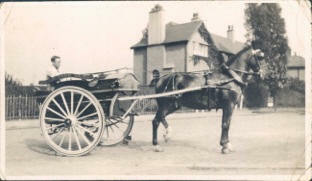 It is parked at the bus pull on Macclesfield Road, just beyond the Rising Sun Hotel in Hazel Grove. Photo taken in the 1960s. 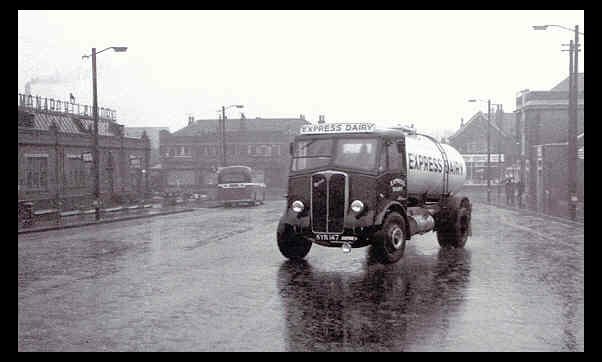 Before Express Dairies took over in the late 1950s, milk and dairy products in South Levenshulme were delivered by Dobson's Dairies using cream coloured electric milk delivery floats. 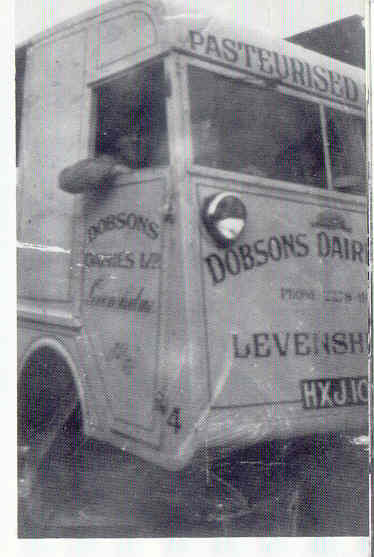 I do not know how long Dobson's existed as a company, or if they had other premises. Update:-January 2013. 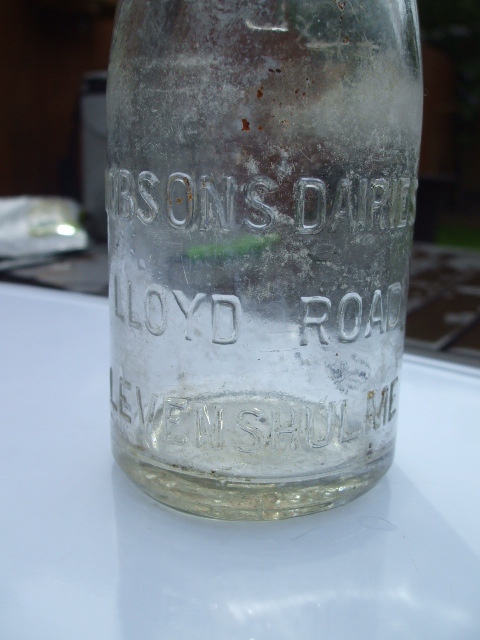 I recently made contact with Peter McLoughlin whose father worked for Dobson's in Levenshulme & Chorlton both before and after World War 2. 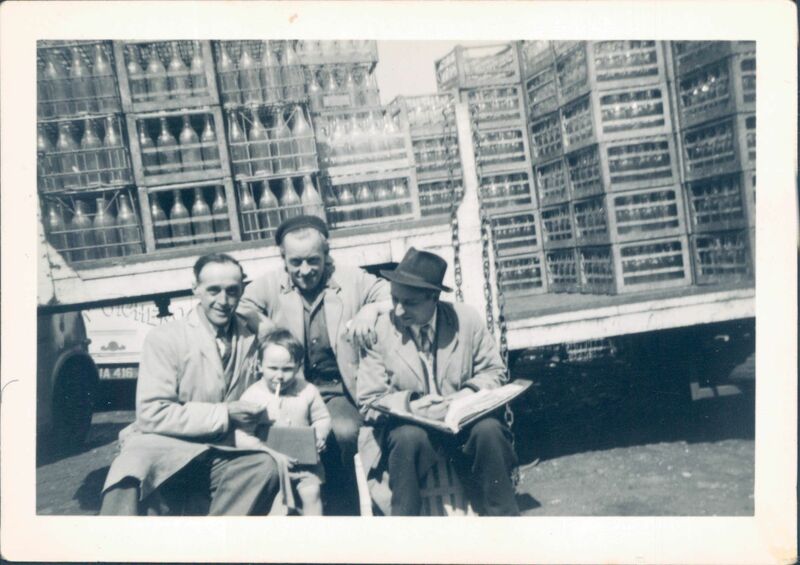 He sent me some photos from that period, some of which I am now adding to the site! This is probably an NCB Electric Float. Dobson's had their own workshops and probably built the bodies onto NCB supplied chassis. 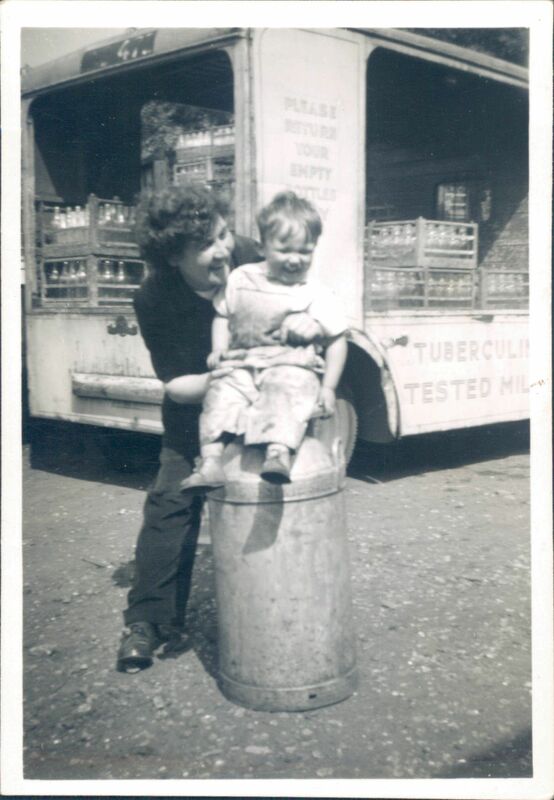 The second photo shows a young Peter McLoughlin sampling a 1/3 pint while standing next to a Dobson's lorry at Lloyd Road, early 1950s. Peter McLouglin was a popular kid around Lloyd Road! 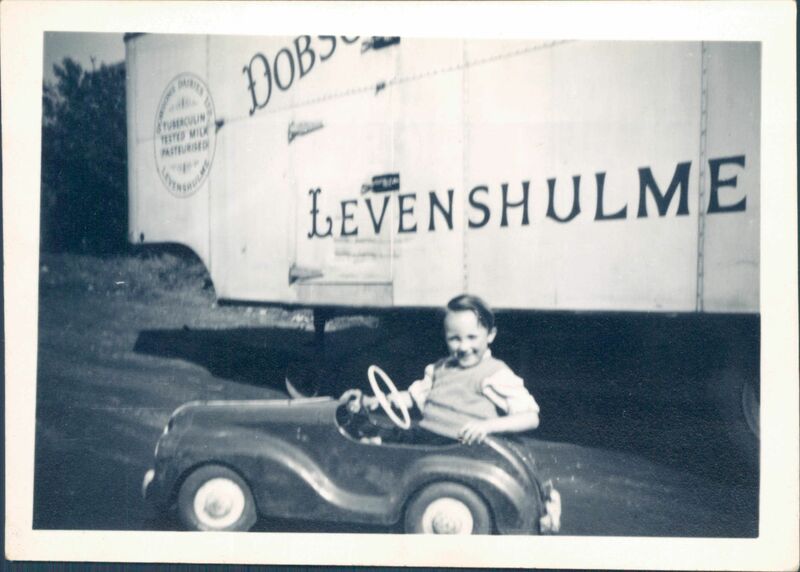 Here he is seen, with his posh pedal car, alongside a Dobsons articulated van. Also with some of the dairy staff. Late 1940s & early 50s. Two more photos of peter at Lloyd Road. One with two dairymen & sitting on a milk churn with Madge! Here we see Peter with Jack the dog. The Dobson's watch dog? 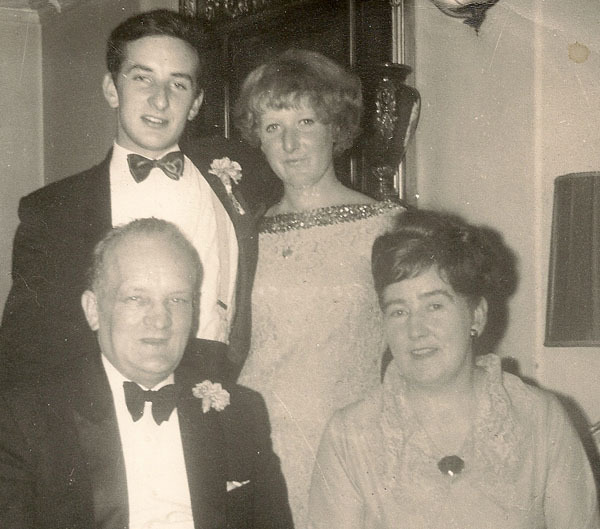 Second photo shows Peter, Madge and a gentleman by the name of Peter Lamb. 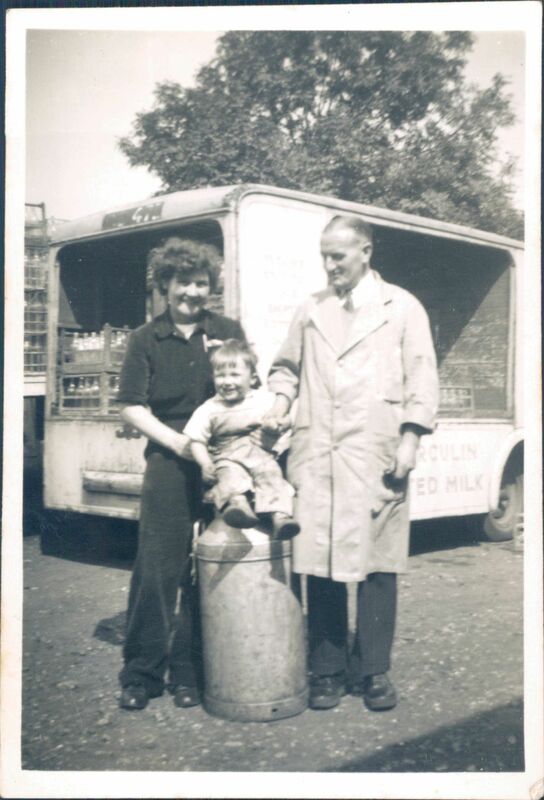 Peter McLoughlin's Dad delivering milk in Chorlton in the 1920s? The horse is called Ginger!! Local Private Hire Coach Operators in the Levenshulme Area. Hubert Hackett, #3 Chapel Street, Levenshulme. 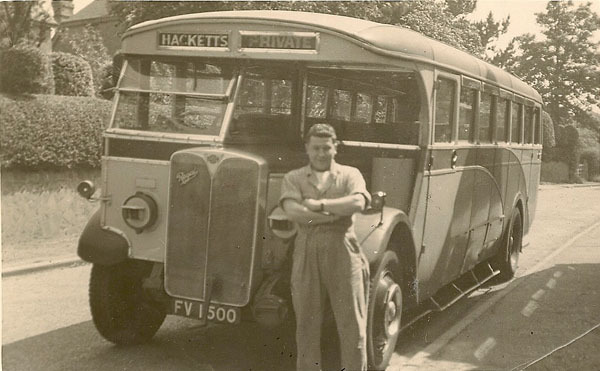 I recently came into contact with Geoffrey Hubert Hackett, the son of the late Hubert Hackett who has very kindly sent me a biography of his father, plus some very interesting photos of the Hubert Hackett coach fleet and operations. "My father was born in Greenheys, Manchester in 1907, the youngest son of Tom and Leticia Hackett. At the age of 12 he started washing and cleaning hackney carriages, both motor and horse drawn at 5 am on his way to school. On leaving school at 14 he took an apprenticeship at Manchester Garages on Fords, but he also kept up the cleaning work. 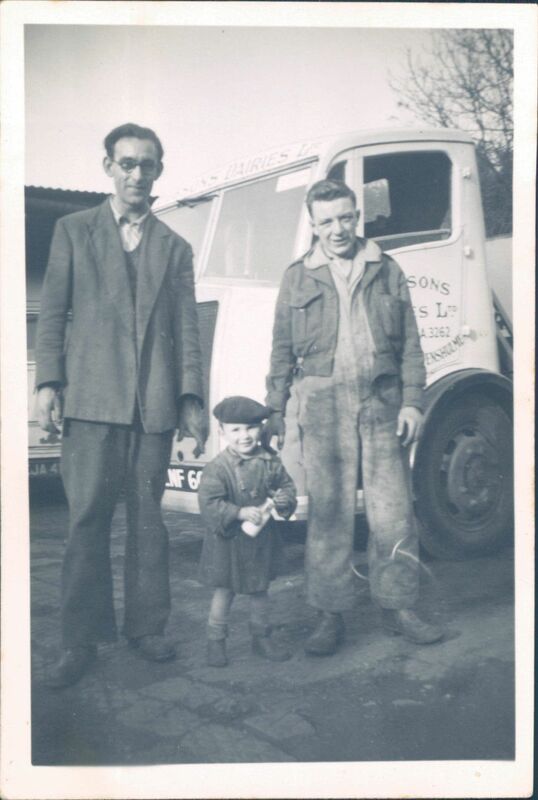 This following completion of his apprenticeship allowed him to save for and buy his first lorry. He was able to use his to get a contract with Beatty's coal merchants to take coal from the sidings to Gaythorne gas works. Shoveling three loads a day from the floor instead of two, as most did was, it was by this effort that he was soon able to buy a demountable coach body. This allowed him to continue to deliver coal in the week, then on Friday night to take the lorry body off the chassis, put the coach body on and on Saturday and Sunday take people to the seaside, mainly Blackpool and Southport. 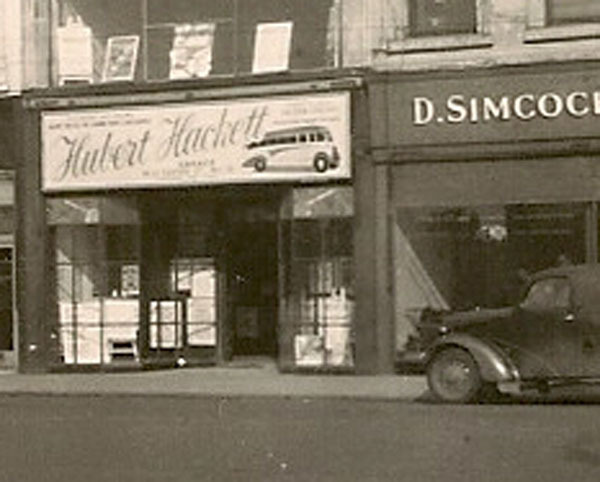 Thus was born Hubert Hackett Transport. 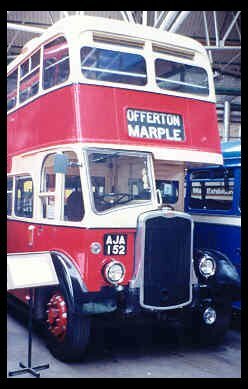 After the war he concentrated on passenger transport acquiring several South Manchester coach businesses including Timperlys coach subsidiaries, Timperlys Blackpool, Wilmslow Petrol Co. and William Hartleys tours, and operated Manchester and Stockport taxicabs. 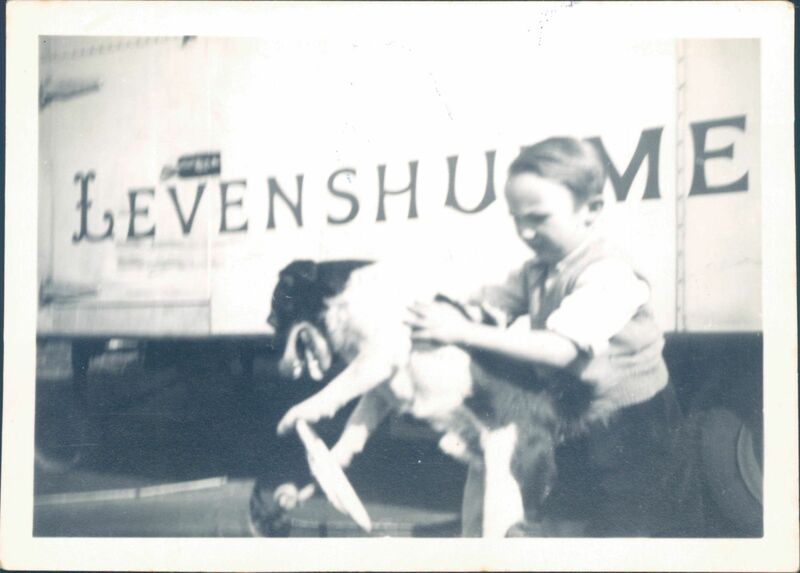 He loved the passenger business over haulage because of the pleasure he got from seeing peoples smiling faces after a trip out. 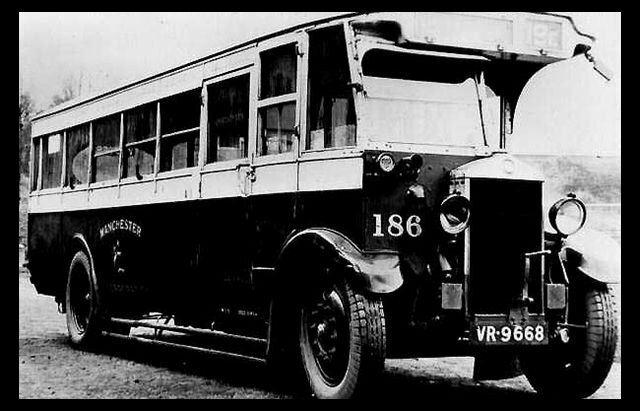 As important as the vehicles and the locations were in those days the essential acquisition was the licences to operate, and every operator was restricted to the number of journeys and passengers that they could carry to destinations like Blackpool or Llandudno etc. 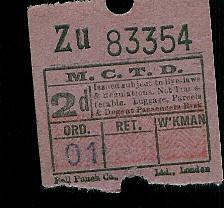 These licences were to protect the nationalised railways in the early days. 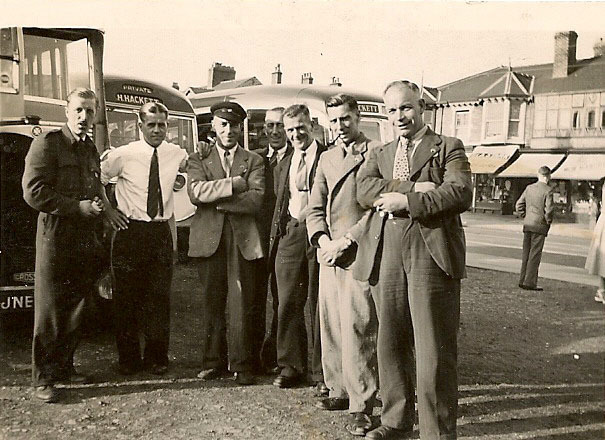 After the war my father was taking a thousand people a day to Blackpool, and he had more than forty new coaches on order and was rivaling the North Western Road Car Company! Then a series of not unrelated, and some under hand events took place with a planted general managers corrupt accountants, and some other maneuverings. In the same period my father was hit by super tax that was nineteen shillings and sixpence in the pound, 97.5 percent. This meant him selling his garage, and several of his businesses. He became very ill and bedridden with a heart attack. 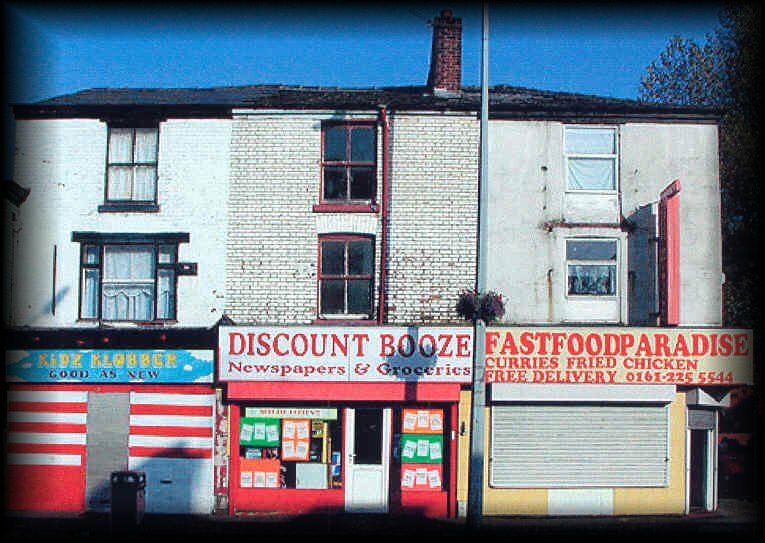 On recovery, some six months later, he moved his much reduced business operation mainly into number 3 Chapel Street, Levenshulme. 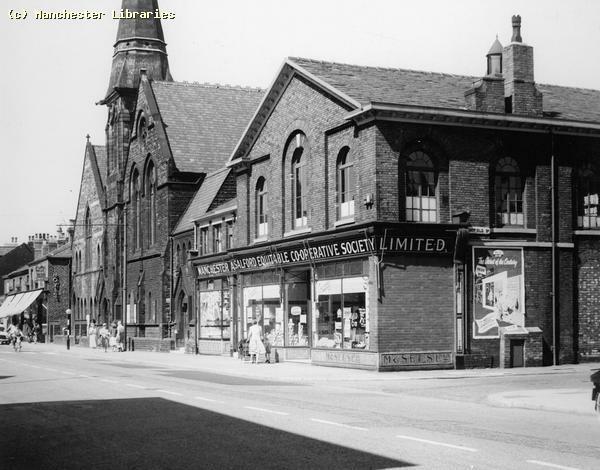 This was the old base for Hartley's, and from where he operated his diminished business until 1969, when through a protracted deal he eventually sold bits of his business to several of the other South Manchester operators and to Smiths of Wigan. He lived at his house in Highfield Park, Heaton Mersey with his wife Ruby, his widowed sister Doris, my sister Stephanie and I until his death in 1984. My sister and I each having married and moved in the 1970s. 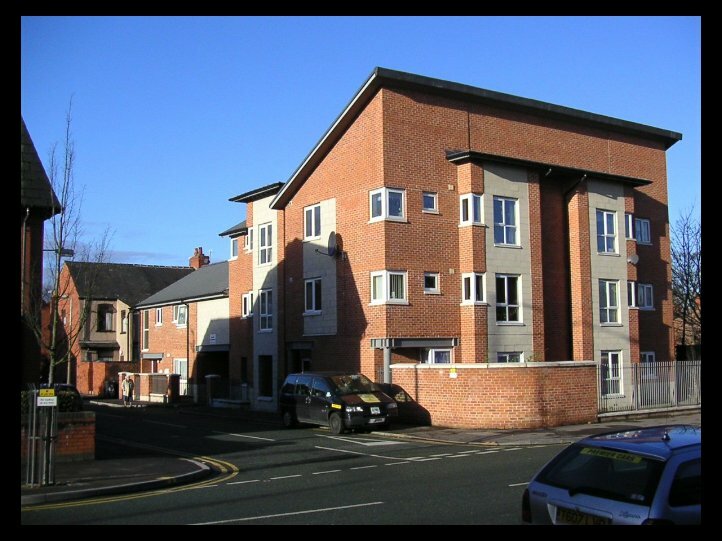 Mother sold the family home in 1988 and moved to a smaller house in Heaton Moor, her sister in law moved there with her. Aunty Doris died in 1990 aged 90, my mother died in 2000 aged 80." Some Photos of the Hubert Hackett Fleet and Operations Etc. 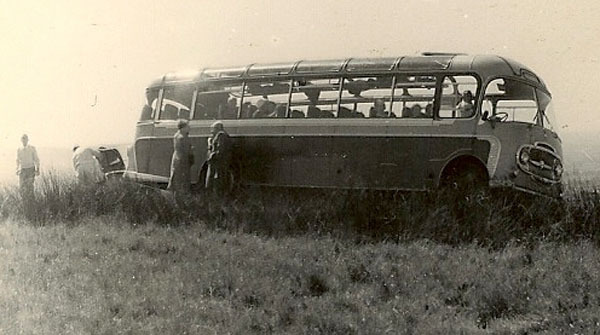 Bedford QB29 Seat Coach, circa 1950, location unknown. 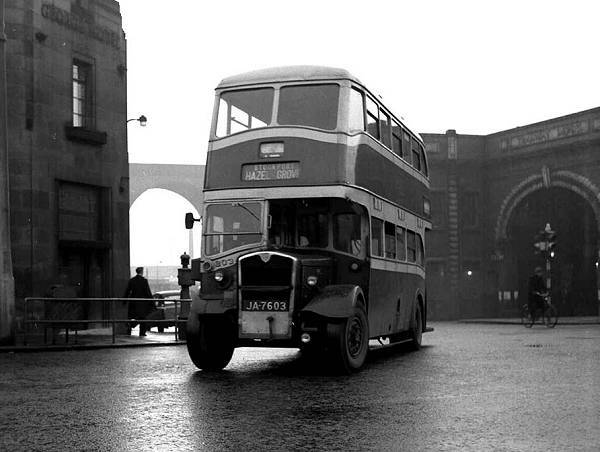 A very familiar sight to 1950s day trippers! Off to the seaside!! Location, Adlington maybe!! Outside the Denmark Hotel. Can anyone tell me the make of coach and the location. 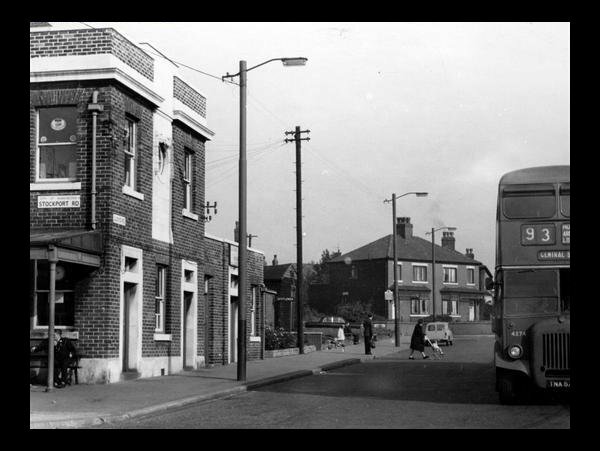 Maybe Denmark Road, Moss Side! Early 1960s Plaxton Bodied Bedford. Making a comfort stop? Coach being operated during wartime. Notice the cowelled headlights. Not sure of the make. Is it an AEC Regal? Some of the drivers at Blackpool. Post -War. The driver on the left appears to be wearing an ex-RAF uniform! Hubert Hackett Booking Office at All Saints, Manchester. 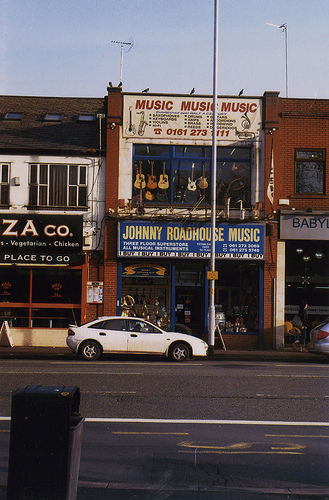 These premises were later occupied by the Johnny Roadhouse Music Store. A recent photo of the Johnny Roadhouse Store. This Half-Cab Maudsley Marathon 2 (60093) Coach Reg JNB 416 was originally operated by Hubert Hackett Coaches, Manchester in the 1950s. 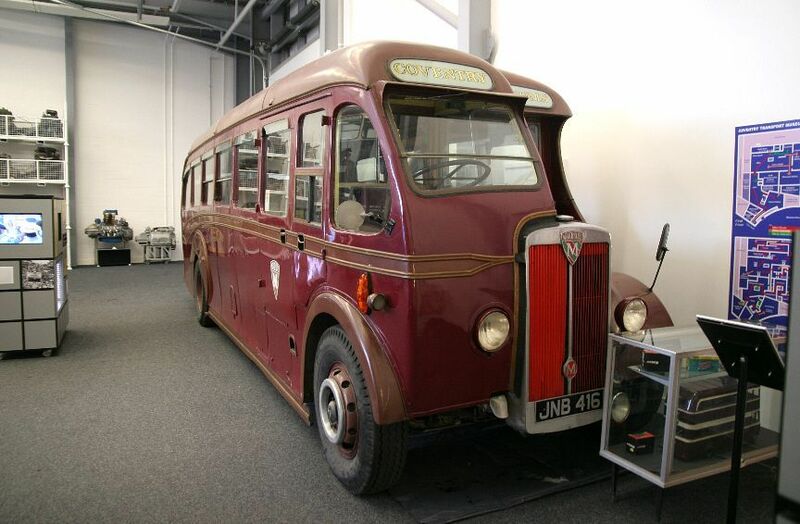 It passed on to other operators in the Coventry area, and is now preserved at the Museum of British Road Transport in Coventry. William Hartley (Tours) Ltd, #3 Chapel Street, Levenshulme. William Hartley (Tours) Limited operated out of garage premises at #3 Chapel Street. 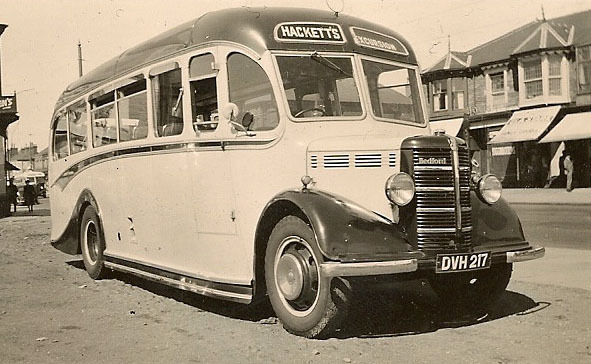 The business ceased operations in the early 1960s, and the premises were taken over by Hubert Hackett Transport who operated coach tours from these premises until 1969. (See Above). 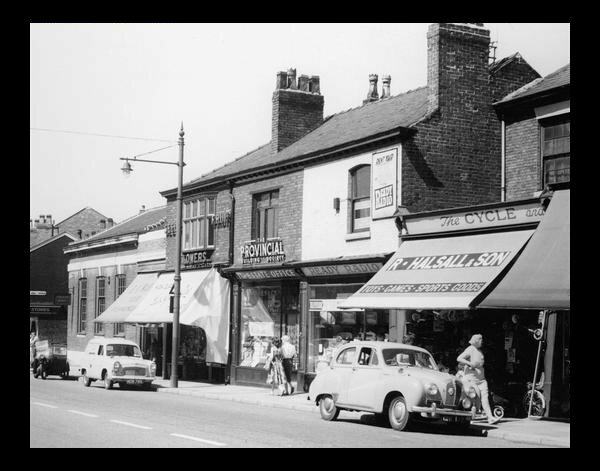 Of all the shops on Stockport Road my favourites, as a child, were definitely the toy shops. The three main ones that I remember were Halsall's, Newmark's & Pendleton's. 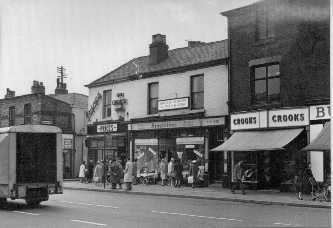 Many of the local newsagents also carried a selection of toys & games and the best one in South Levenshulme was Shaw's, facing Clare Road. 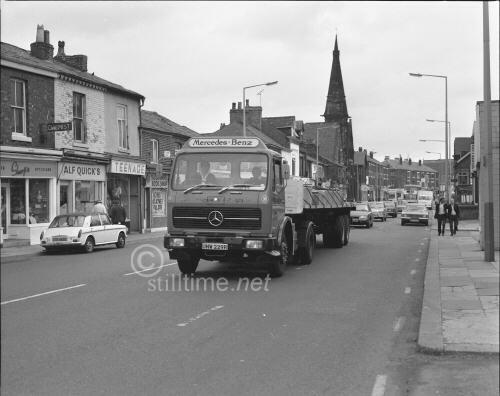 Halsall's Toy Shop. 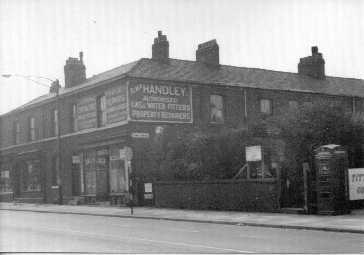 Halsall's had two locations on Stockport Road. 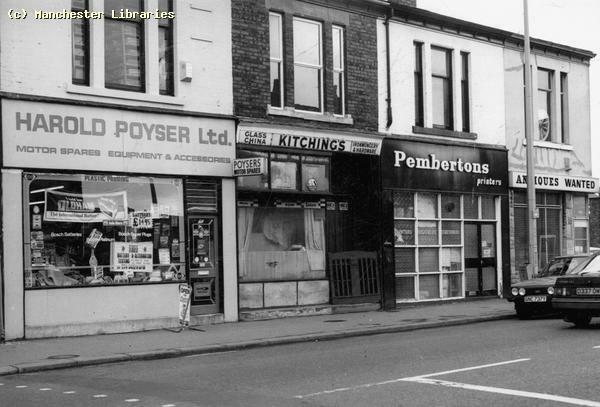 A newsagents next to the Trustee Savings Bank, opposite Albert Road, and a toy shop further south near to Elbow Street. They sold toys, bikes & prams, and at one time had a railway layout in the window that you could operate by placing a penny in a slot! 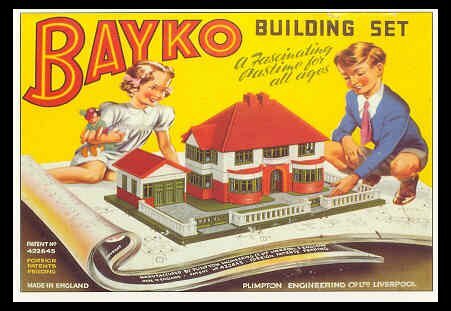 I once joined their Christmas Club & saved all year to buy my first electric train set. Halsall's closed in the mid 1970s, when Mr & Mr's Halsall retired to Wales. At the closure they sold off a lot of vintage toys out of their old stock. 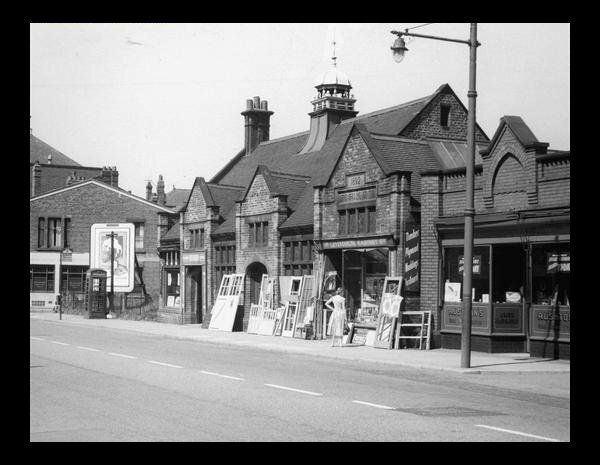 This is Halsall's toy shop in 1959. Note how the upper storey is set back from the shop frontage. (Photo. Manchester Libraries). Newmarks Toy Shop. Newmarks opened in the 1950s, and was owned by Mr's Newmark. Her mother operated the well known bazaar next door. They were only a few doors south of Halsall's. They sold cheaper toys & games, but you could always find something to spend your pocket money on at Newmarks. Pendleton's Toy Shop[. Pendleton's was a sports & toy shop. 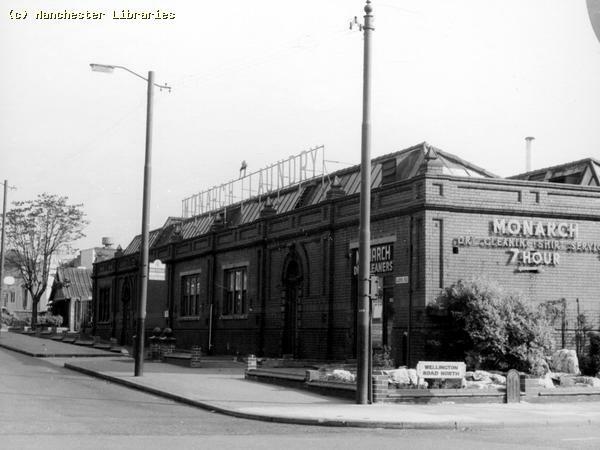 They were originally located next to Martins Dry Cleaners near Albert Road, but later moved to South Levenshulme opposite the Town Hall. 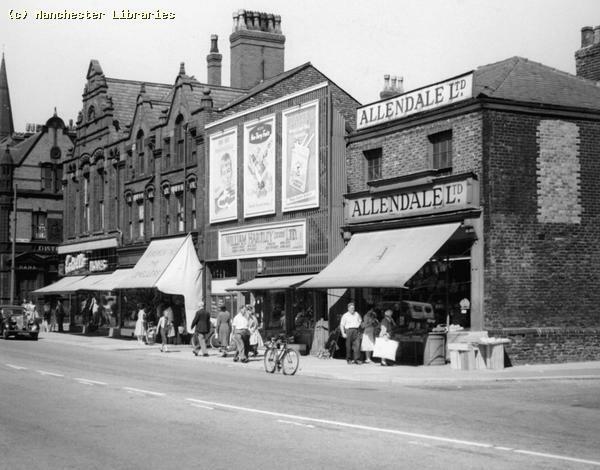 Pendleton's was the last "real" toy shop to operate in Levenshulme. 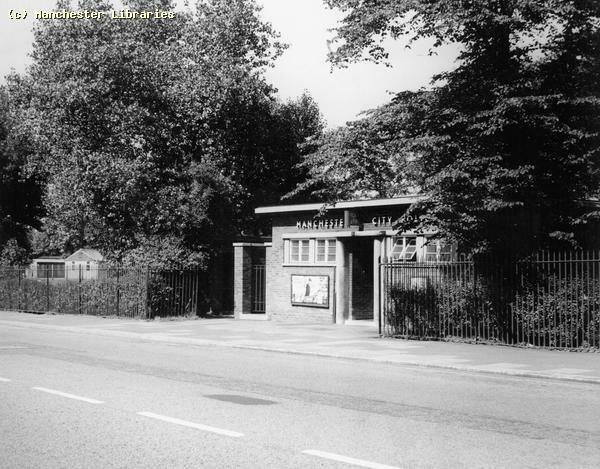 For most of the time I went there it was managed by a Mr's Brown, whose son Kenneth went to Alma Park School & later Didsbury Tech. Shaw's Newsagents & Toy Shop. 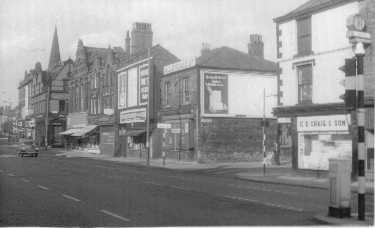 Shaw's Newsagents was located on Stockport Road in South Levenshulme, opposite Clare Road. It was primarily a newsagent, but also had a large toy section at the back of the shop. They sold lead & plastic toy soldiers & also Corgi Toys, amongst many other toys & games. I remember that if you only bought one toy soldier they would still wrap it in tissue paper & put it in a paper bag. What service!! Babyfair. Babyfair, as its name implies, sold mainly prams & baby supplies. 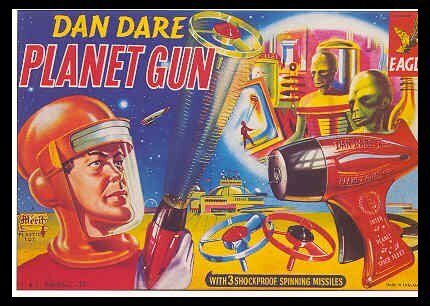 However, they did carry some toy lines, such as Spot-On cars and Tri-ang Toys. My sister Rosemary worked there for a while & I ended up with some great Christmas presents that year! 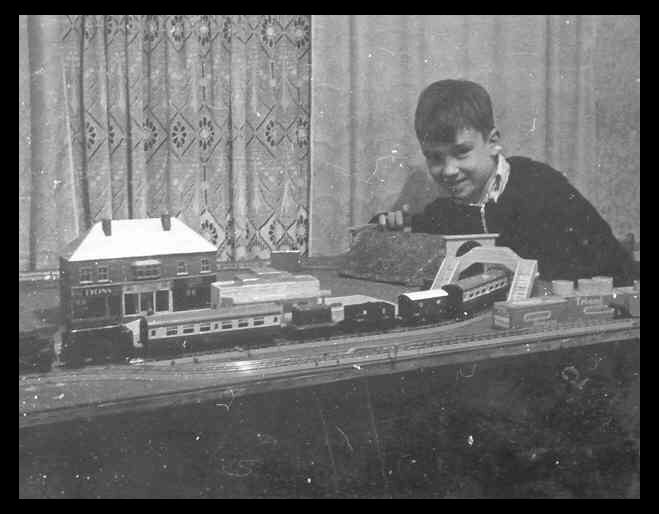 The above photograph shows my brother-in -law, David Arnold, playing with his Tri-ang Train set. This was a Christmas present in 1955. It was probably bought at Halsall's, as they were the local stockist of both Tri-ang & Hornby Dublo trains. I am now a collector of these old train sets, which were widely exported around the world. Tri-ang Trains Catalogue 1964. A Levenshulme Connection! 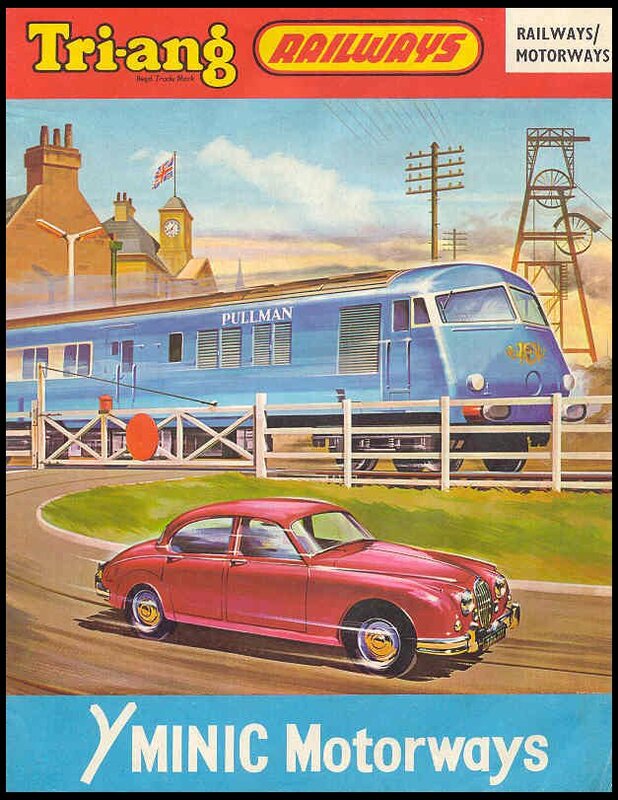 Although it is a very tenuous connection, the Blue Midland Pullman train shown on the front of this 1964 Tri-ang Railways catalogue, did pass through Levenshulme South station in the early 1960s. 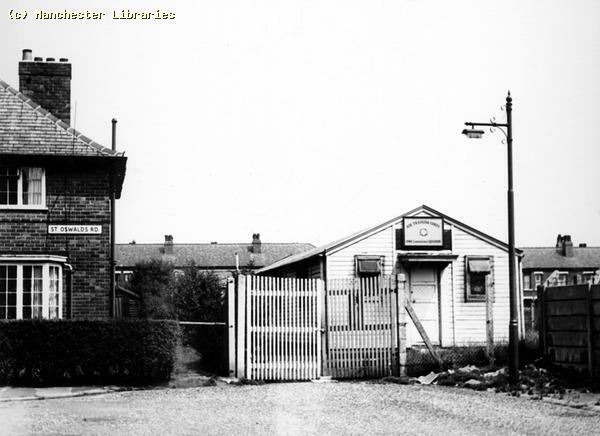 The real trains were based at Reddish Sheds, and made the daily transition from there to Manchester Central Station. They then operated a service between Manchester & London, St Pancras. I vividly remember the trains stopping at the Levenshulme South Station, while waiting for a signal, and the rumbling sound of their diesel engines. Does anyone have , or know of any photos of these trains at Levenshulme or Reddish? See my Railways page for more detail and photos. If anyone can remember any other toy shops that I have missed, please let me know. 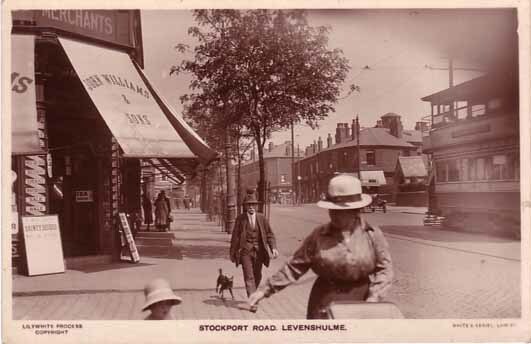 Also photos of Levenshulme toy shops would be appreciated. 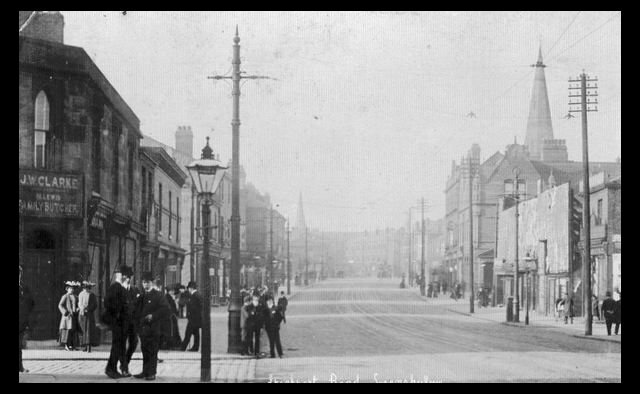 This photo of Stockport Road was taken from the corner of Carrill Grove. The period seems to be the early 1930s. 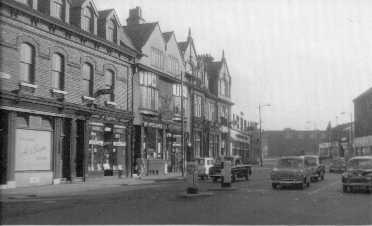 Note the John Williams store on the corner, a well known name in grocery well into the 1960s. Also note the St. Peters Lytch gate in the background. 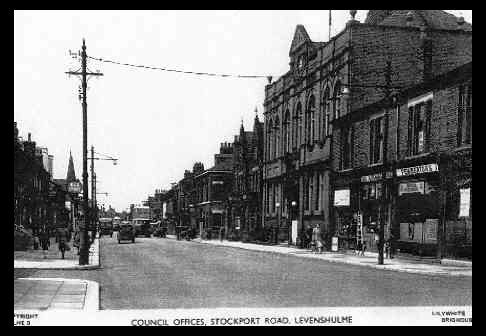 As Levenshulme grew into a thriving community the need for a police presence was established and a fine stone faced police station was built on Stockport Road. This adjoined the new Levenshulme Town Hall. The station was under the control of the Lancashire Constabulary, and its coat of arms were emblazoned over the side gateway. There were very likely stables at the rear of the building. When I was a child this building was the local school clinic. 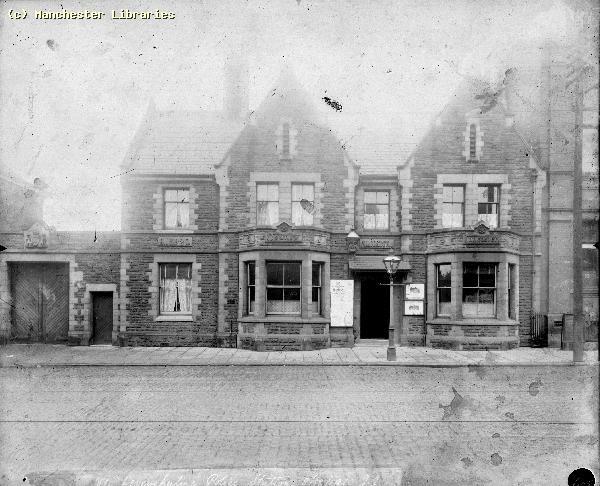 An early photo of Levenshulme Police Station. 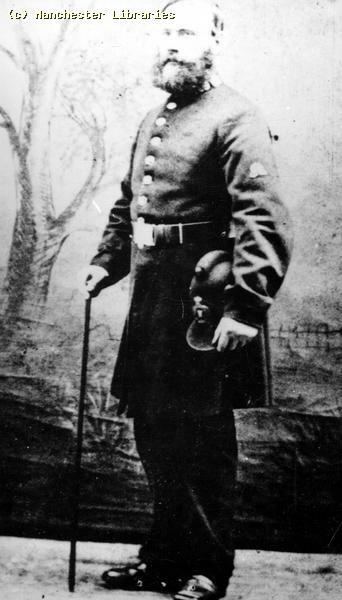 This photograph shows Constable Irving, Levenshulmes first policeman 1890. 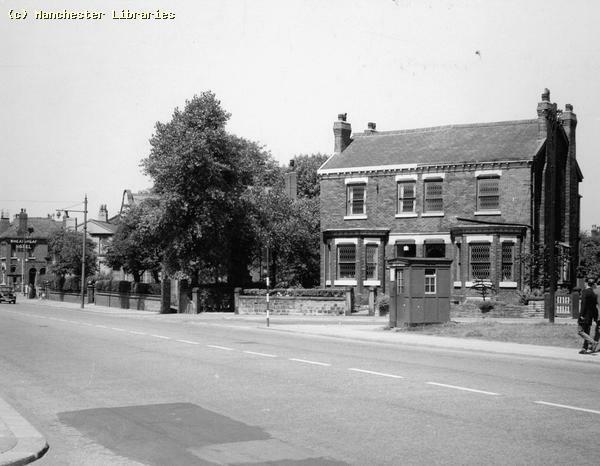 An interesting photo showing a police call box situated at the corner of Cringle Road and Stockport Road. This would be a refuge for patrolling police constables, and it also had an emergency phone for the use of the general public. Were there more of these boxes in Levenshulme. The box was painted blue, and was the Manchester equivalent of the Metropolitan Police box made famous as Dr Who's Tardis in the popular BBC TV series. When did this unique building disappear? Were there any other such boxes in Levenshulme? 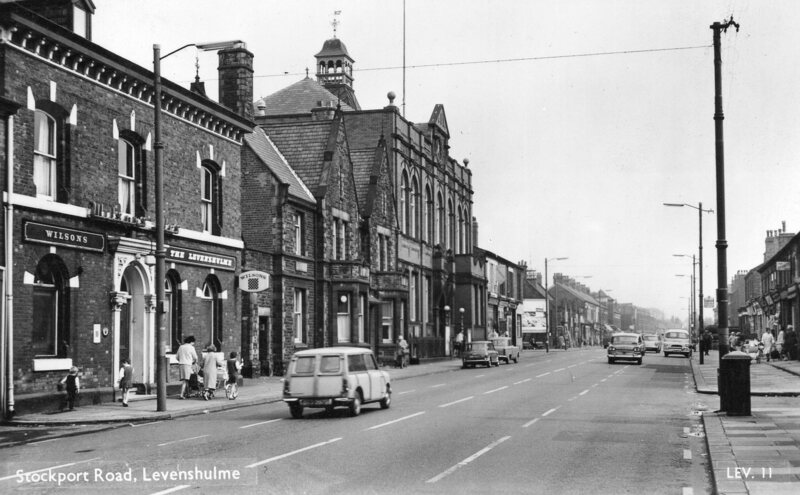 In the 1950s and 60s, Levenshulmes police needs were administered from the small police station on Stockport Road, near Crowcroft Park. Now the nearest police station is in Gorton.